Cat Island is very special and non-touristy place. Yesterday as we walked around New Bight and strolled along the main road, every single person waved and greeted us. We are so glad we made the effort to come to this Out Island, thanks to Bentley and Jim of sv/Salty Paws who insisted that we sail here. They have told us for years to get out to Cat Island. 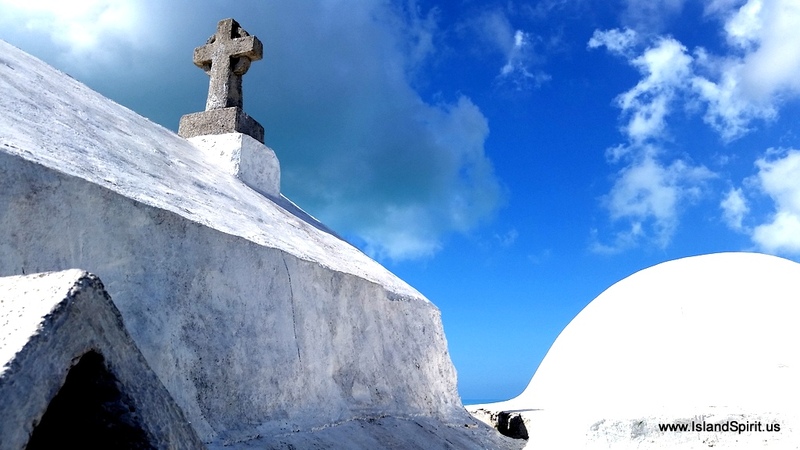 Day one was New Bight and the hike up Mount Alvernia to Father Jerome’s Hermitage. After that we sailed 1.5 hours north to Fernandez Bay where we dropped the hook right off the beach on one of the most beautiful bays we have ever seen. Look at this view over our bow…. As we walked the one mile beach, we looked back across the bay and zoomed in to take this photo with the rocky point to the northwest of the bay compressed into Island Spirit, so it looks closer than it is. We have our sunshades up all the time because we really try hard not to get too much sun. It is so bright and so intense that we get sunburned very easily. So, up with the shade every day. The “honor” bar where you help yourself and pay later. 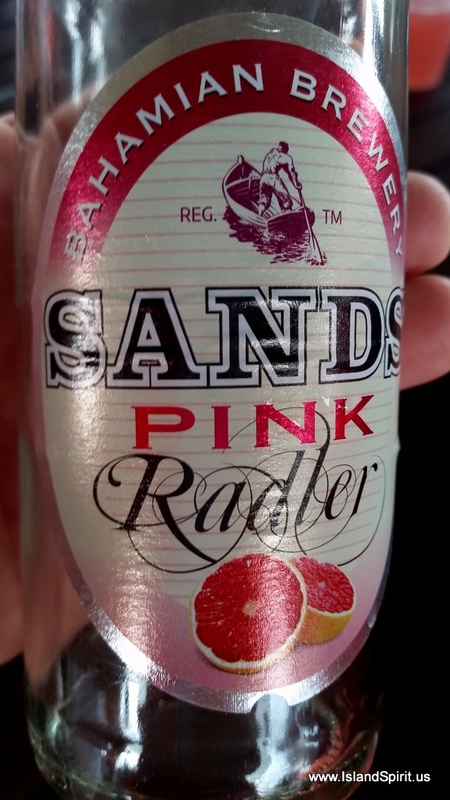 Great rum punch! After a nice lunch and a long walk on the beach, we decide to cool off with a late day beach swim. This beach ranks as one of the most beautiful beaches we have been on. 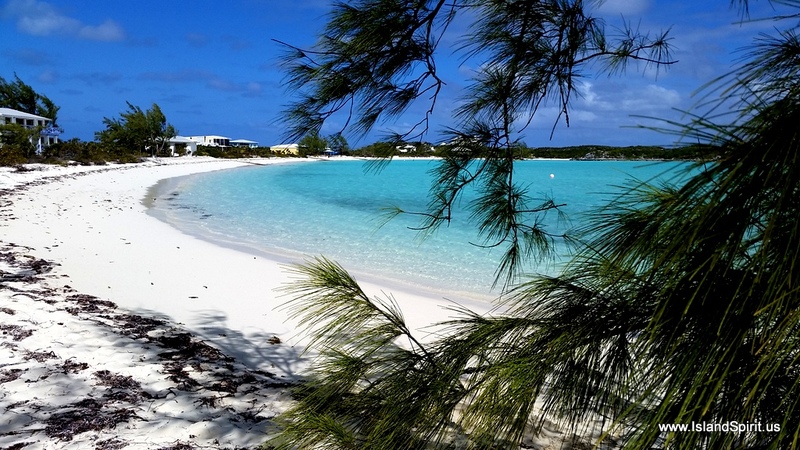 The sand is powder smooth and very firm and of course the water is “gin clear” like all lower Bahamian islands. 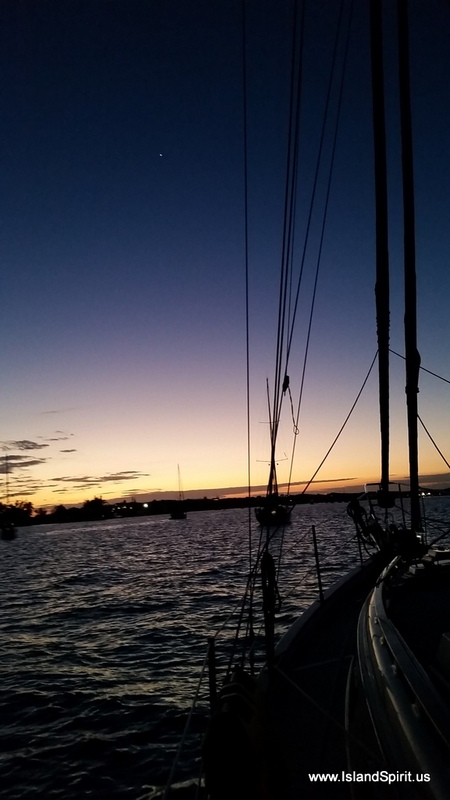 Just as we were preparing for showers and sunset, our buddies on Crealock 34 Neverland, Cynthia and Jim, sailed in. 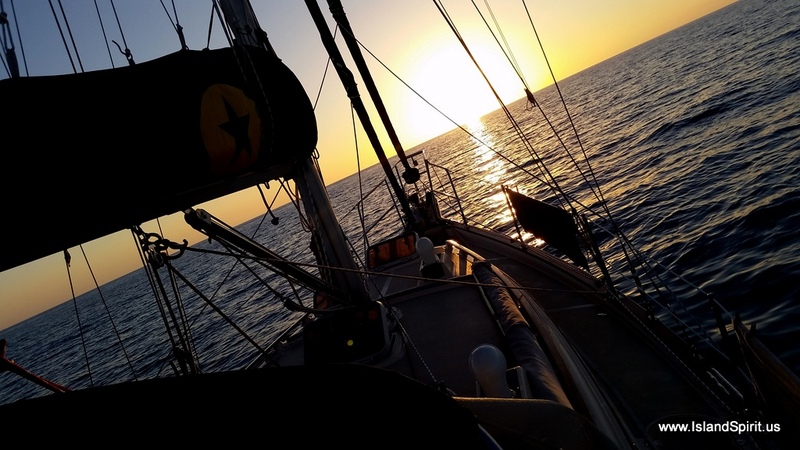 They dropped anchor off our starboard bow and drifted back into a very nice spot. PERFECT, now we have to stay another day! 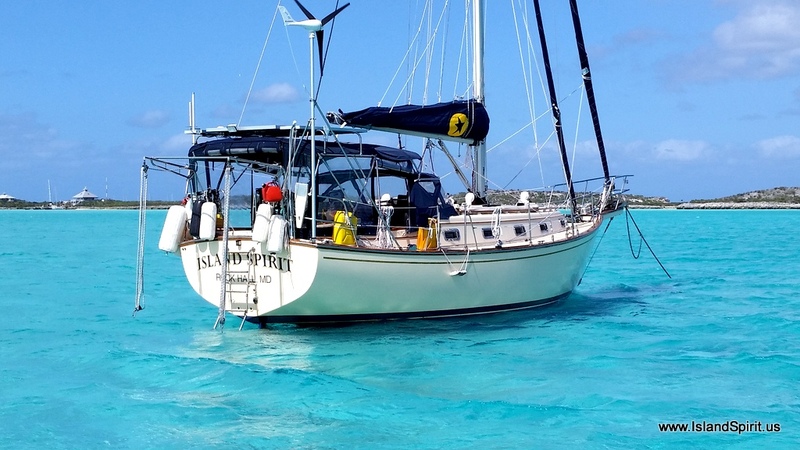 I dinghied over with some fresh yellow tail tuna to share the endless bounty of our fish, and then they stopped over to Island Spirit for a nice visit. We will explore the beach and resort more tomorrow. 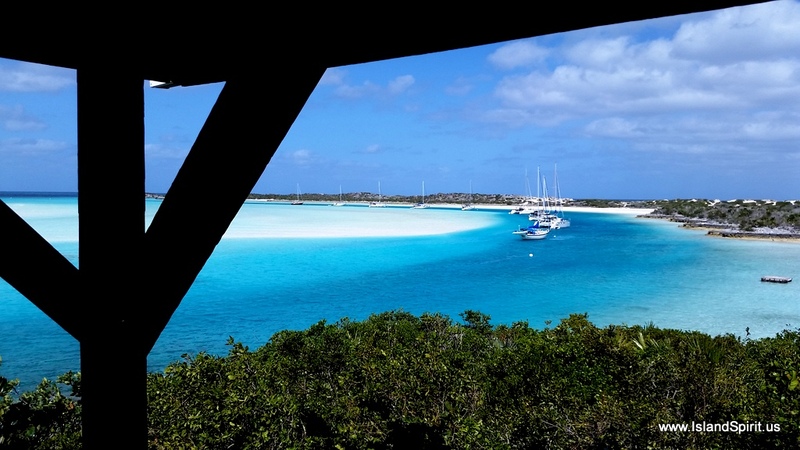 Check out Neverland framed by our galley porthole window. So cool. I love to take this photo. 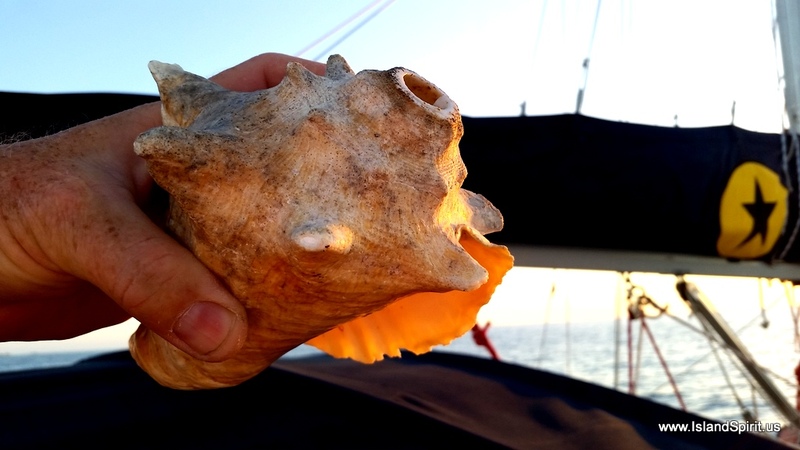 We were treated to another beautiful Bahamas Sunset on the water as the conch horns rang out….. Here is a Google Satellite photo of this location! 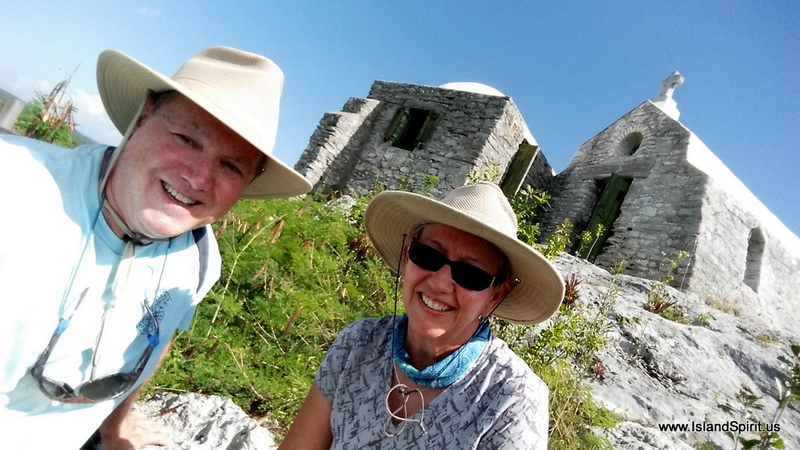 It has long been a goal of ours to see Cat Island and to hike the highest hill in the Bahamas. Prevailing easterly trade winds and bad weather have prevented us from coming to this Out Island in the past, but this year we succeeded! Father Jerome was an Englishman who first trained as an architect and a sculptor. 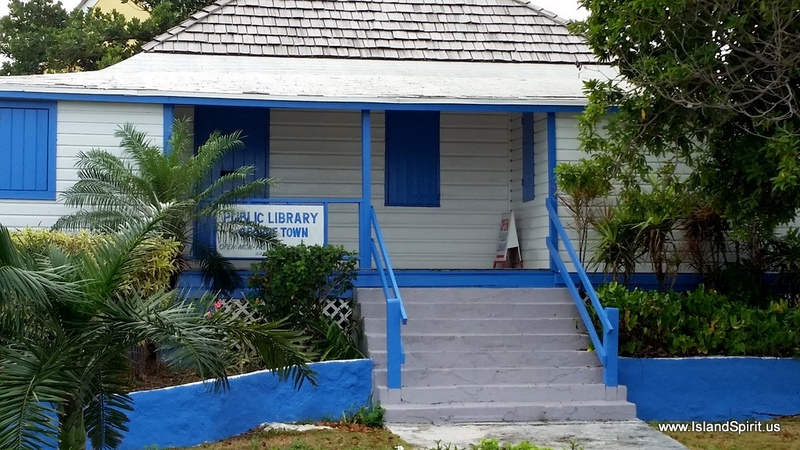 In 1903, he became an Anglican priest who built churches in England before coming to the Bahamas for a brief time. After moving to the U. S., he converted to Catholicism and worked as a wagon train driver and a railway laborer. Then he went to Rome and became a Catholic priest in 1915. Next, he designed and built many large churches in Western Australia. 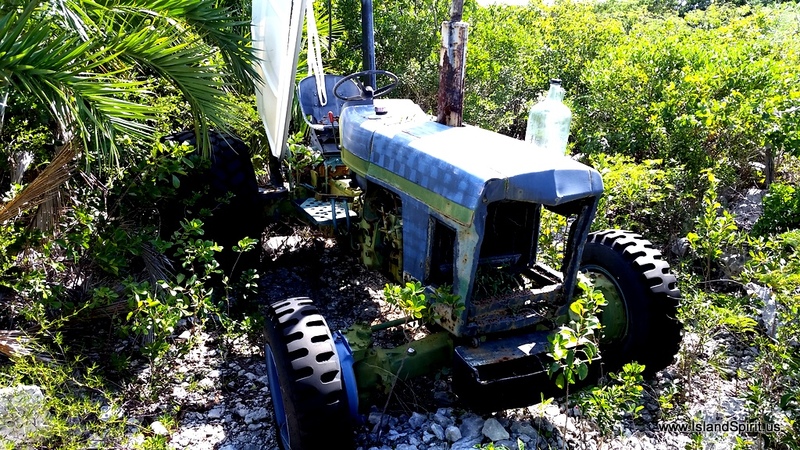 Nearly 20 years later, he returned to the Bahamas, to New Bight on Cat Island. In 1939, Father Jerome began building The Hermitage, his residence with a private chapel and bell tower on Mount Alvernia, 206 feet above sea level. He died in 1956 at the age of 79 and is buried on the property. 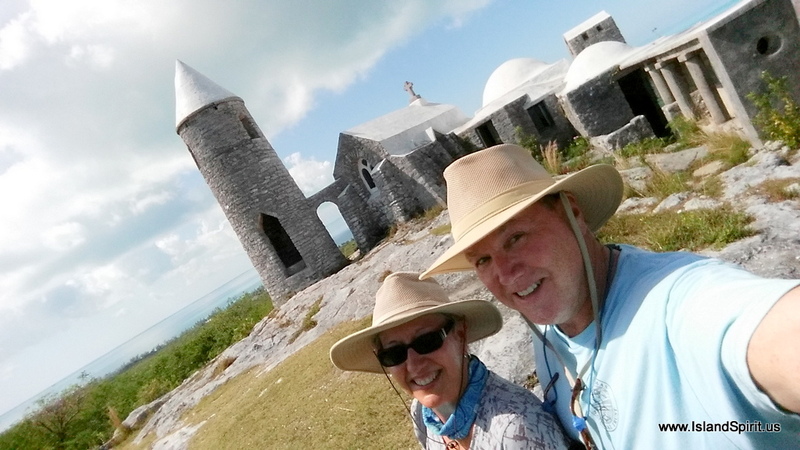 He built a total of 7 churches and one monastery in the Bahamas. 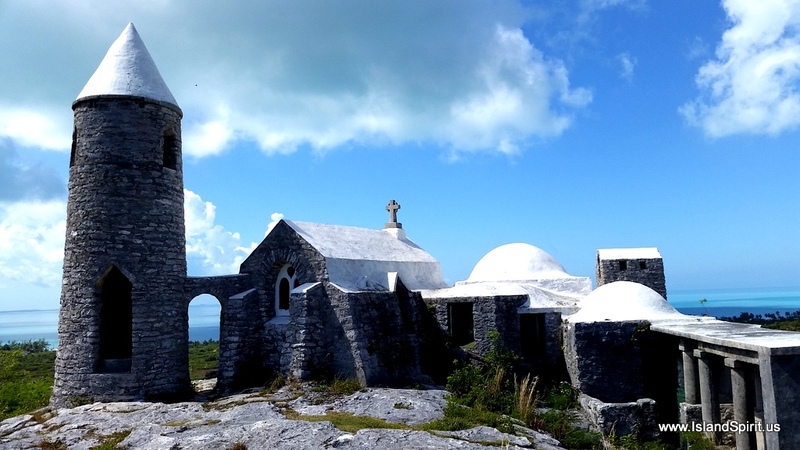 We are fortunate to have already seen two beautifull churches designed and built by Father Jerome in Clarence Town, Long Island, Bahamas. St. Paul’s is Anglican (1910) and St. Peter’s is Catholic (1947). 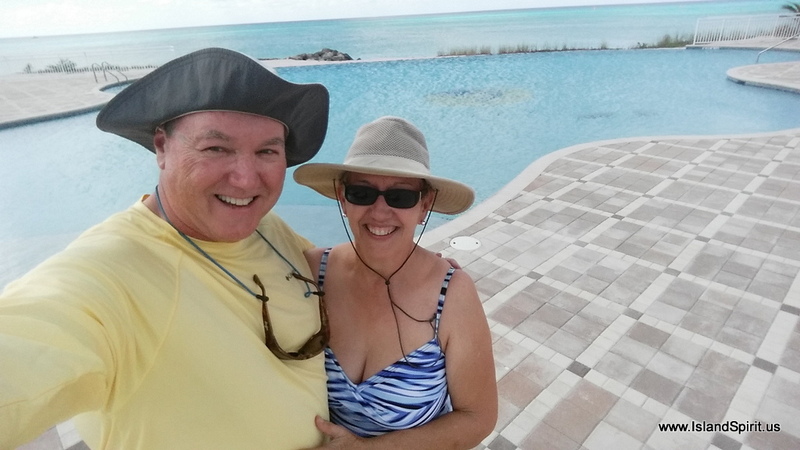 We plan to go to Long Island again, on our way southward out of the Bahamas. Reliefs depicting the Stations of the Cross are along a very steep path to the top. Looking west to the waters of Cat Island Bight. Jerome’s tiny bedroom is on the extreme right. There is debate whether or not this is Father Jerome’s final resting place. The chimney on the right is for the kitchen. The entrance to the chapel through a narrow door. Notice the thick, sloped walls. Arches were used often throughout the buildings. Steep paths in all directions lead from the top of this hill. Island Spirit viewed through the arch beside the bell tower. 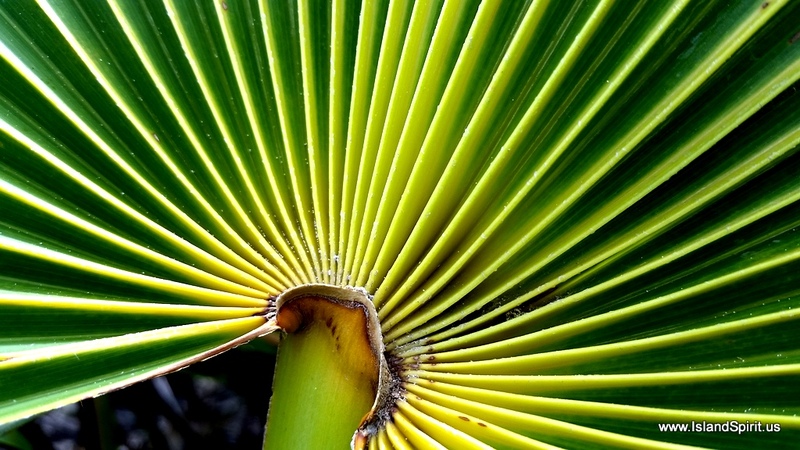 There is a surprising amount of large vegetation on Cat Island, unlike other Bahamian Islands. Stone benches on the beach across King’s Highway from the Government Building. Island Spirit on the horizon. 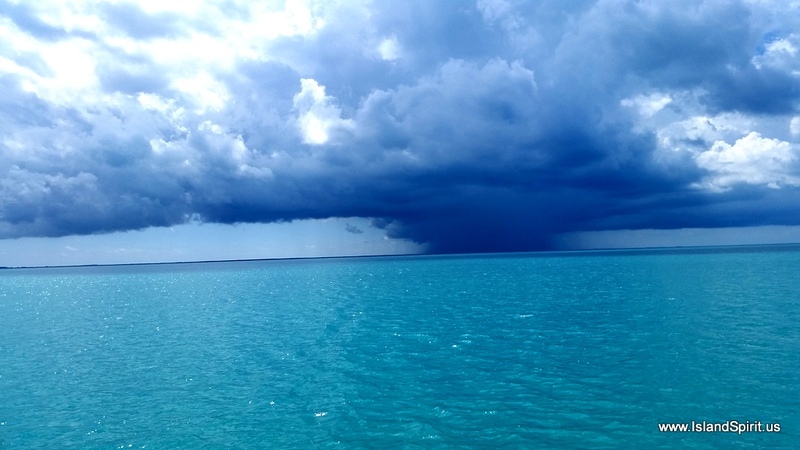 A squall on the horizon that fortunately did not reach us. Today was one of the highlights of our cruising season! 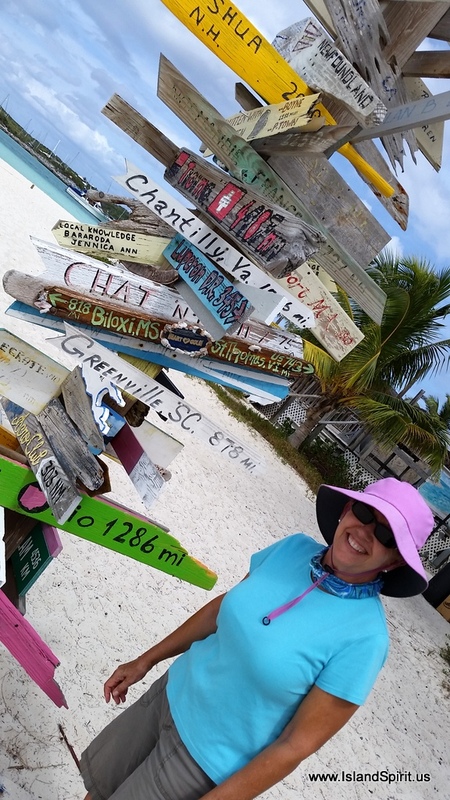 We wish we had more time to enjoy the colorful fish shacks along the beach here at New Bight and the rake and scrape music from the Sailing Center that welcomed us on Saturday evening. The town encourages boaters to visit and has built an amazing bath house with 3 stalls and one shower for men and for women. It is spacious with tile walls and countertops, well ventilated and spotlessly clean. 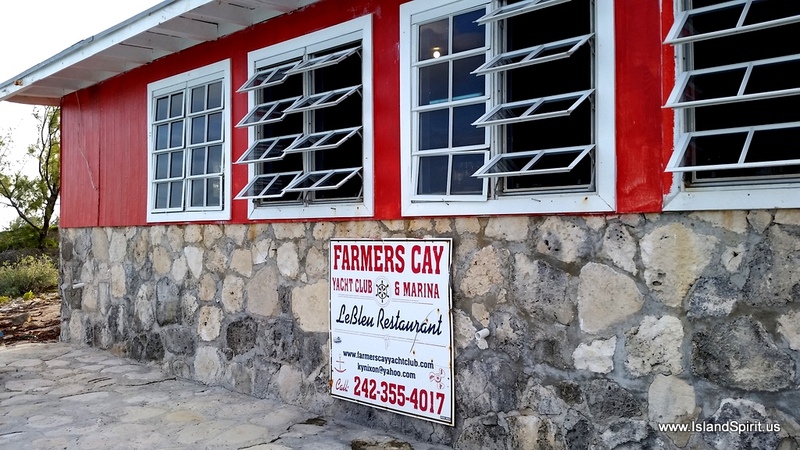 There are no facilities like this anywhere else in the Bahamas. 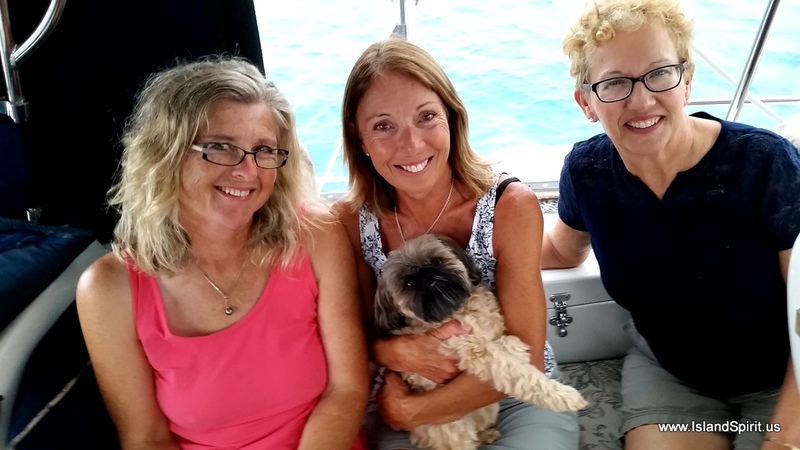 We are grateful to our friends Jim and Bentley of s/v Salty Paws for their excellent recommendations about Cat Island! 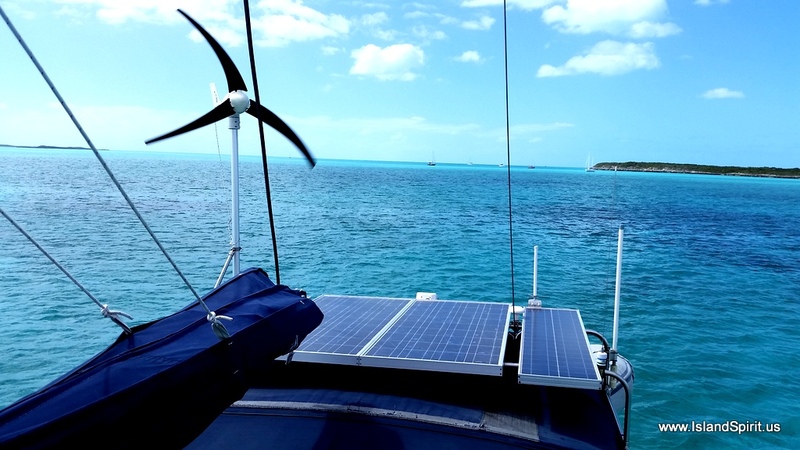 We decided to take this calm weather window and motor over to Cat Island, one of the far islands we have visited in the five years we have sailed to the Exumas. 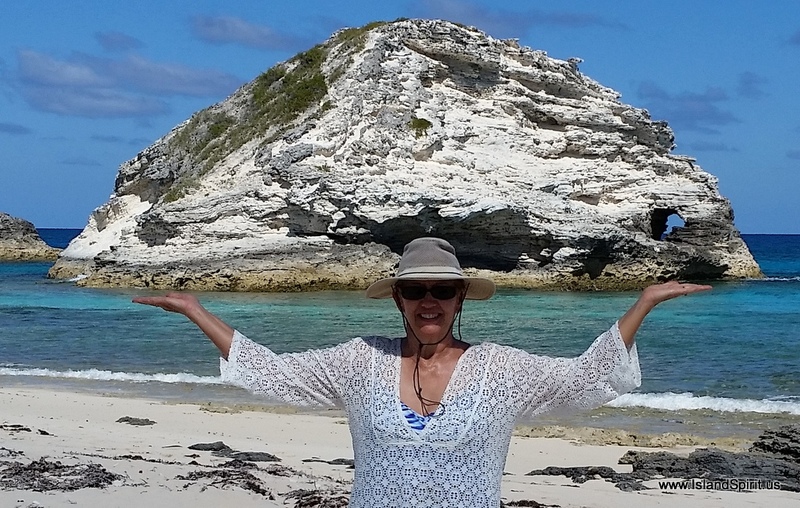 Cat Island has zero protection from west winds, so you need to go there when it is calm, and you can easily stay there when the east trade winds are blowing. Well, we had the calm today to motor the 50 nm over to Cat and tomorrow it will begin blowing from the NE then East so we can anchor safely anywhere on Cat. 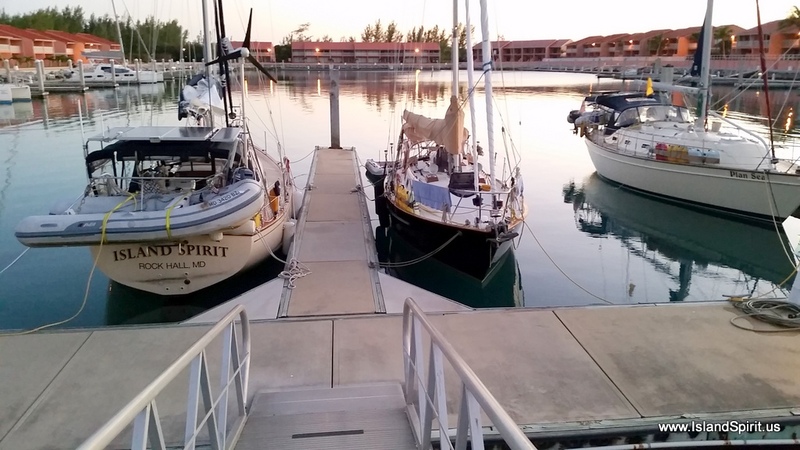 We plan to explore New Bight, and Frenandez Bay and they maybe Hawks Nest marina before sailing back on the East trade winds to George Town for more Regatta fun. 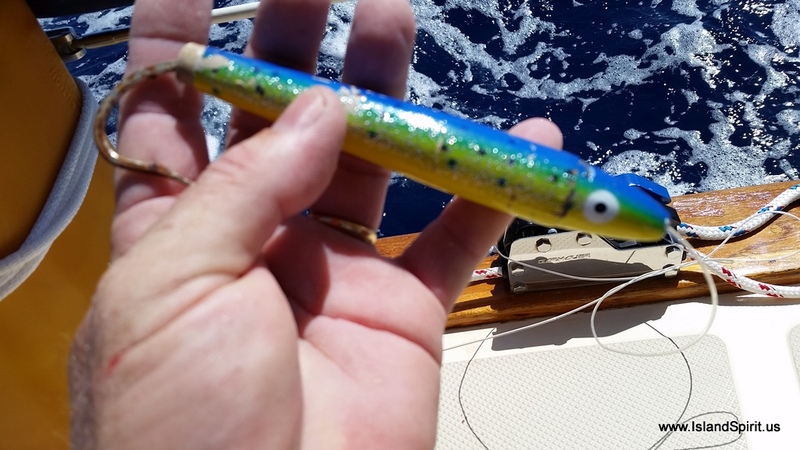 On the way over, I finally landed out first tuna, it was a 28″ yellow fin tuna. We both were so excited. How wonderful to finally land a really nice fish on Island Spirit. 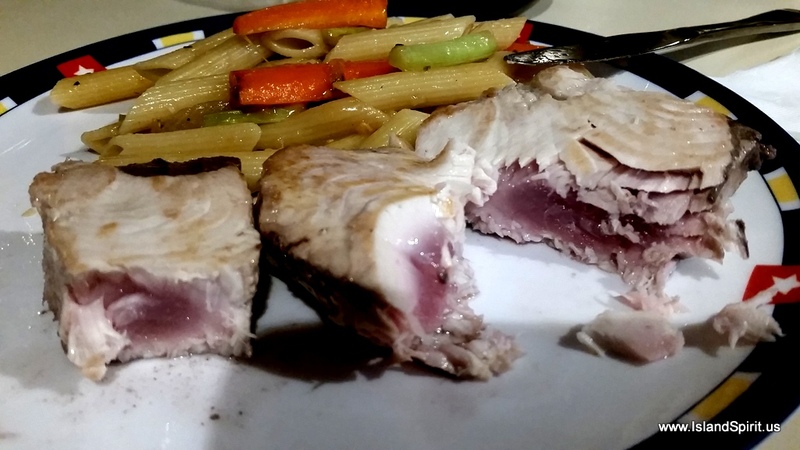 We have trailed fishing lines for thousands of miles and today, we finally landed a nice proper sized tuna, and a yellow fin as that. One of the best. We estimate that this created 16 meals at least and we will share with other boaters. What a great treat! Here are some photos of the adventure. 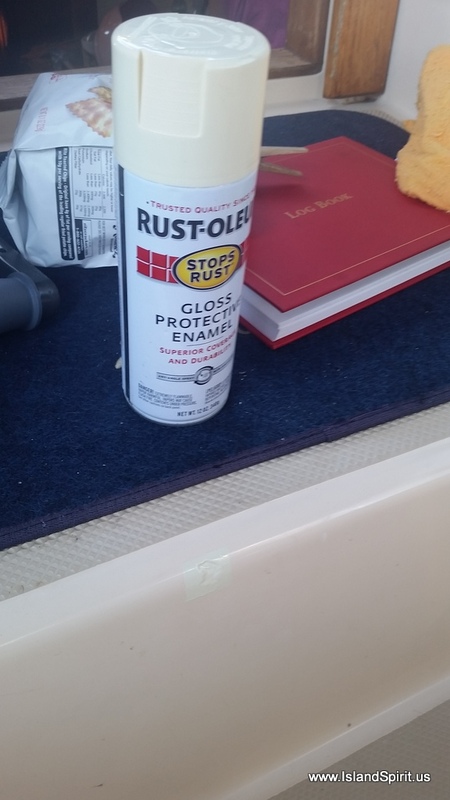 Well….I got so excited during the landing and the taming of the tuna, that I actually damaged our gelcoat as I was swinging the winch handle and knocking out the fish. What??? 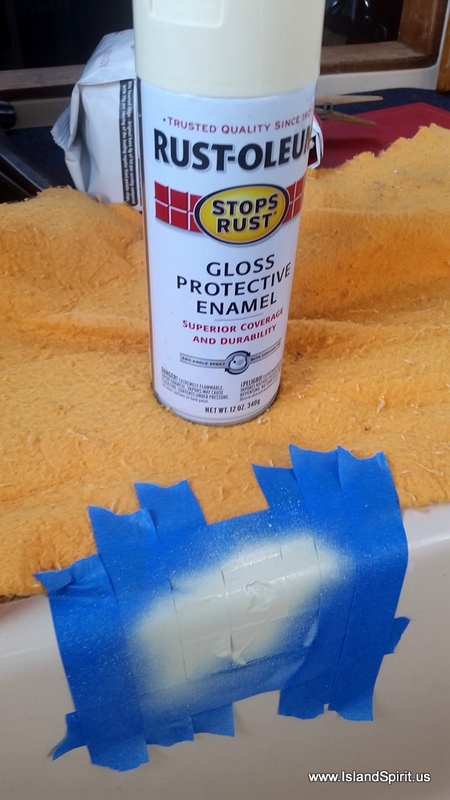 Errrrrr, Well, I chipped the gelcoat as I hit the corner with the winch handle. I did not even know I hit the step. All of it was truly was a Chinese fire drill. We really need to get better at this fishing game. Right now we are newbies. 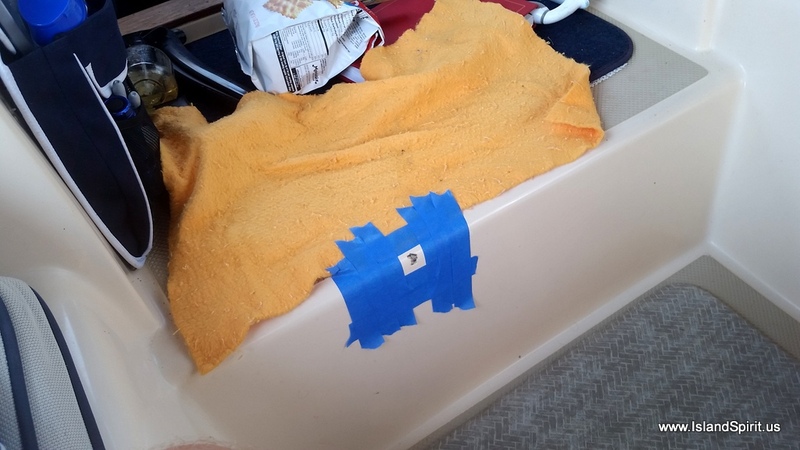 Here is proof of the excitement….errrr….and the damages to our boat….Oh, the price of Tuna! 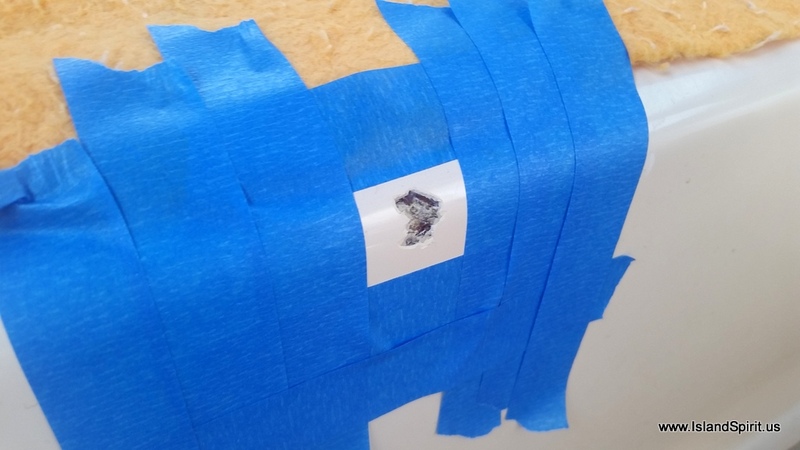 Done….what fish damage? It is gone. 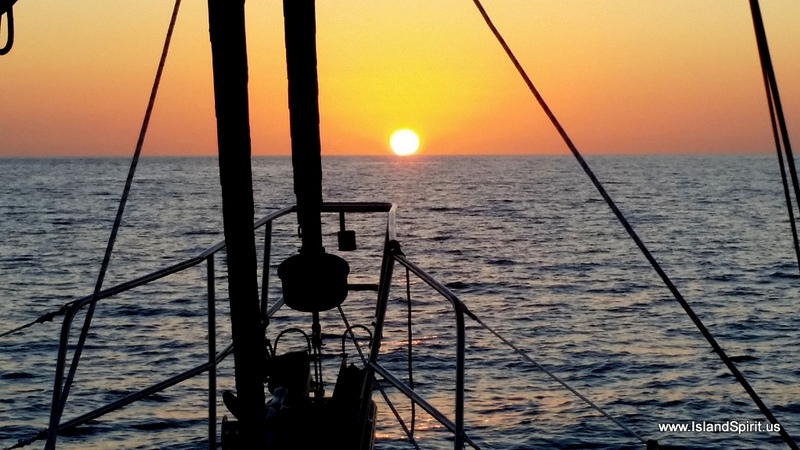 Tonite on anchor, we thought we might actually see our first green flash, but the sunset did not produce one. Still, look how beautiful the sunset was. It was a really great day on the boat. Something new all the time. We have lots to learn about fishing, that is for sure! 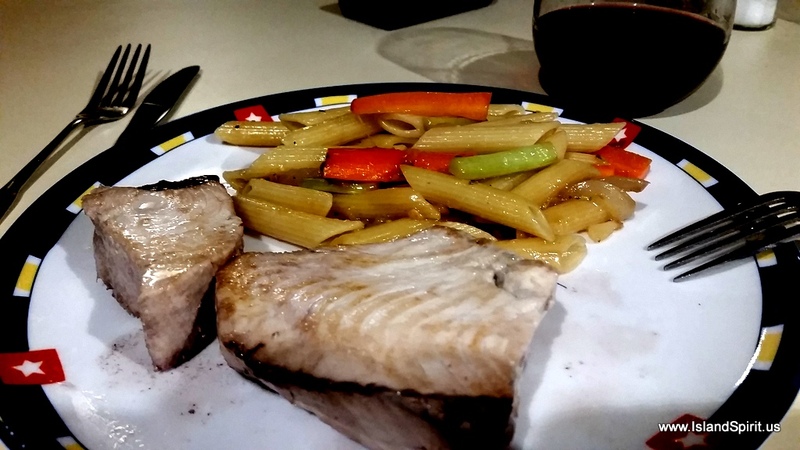 Then it was time for a seared tuna steak, pasta with veggies in a honey and rosemary sauce with some red wine, Bogle Cabernet. 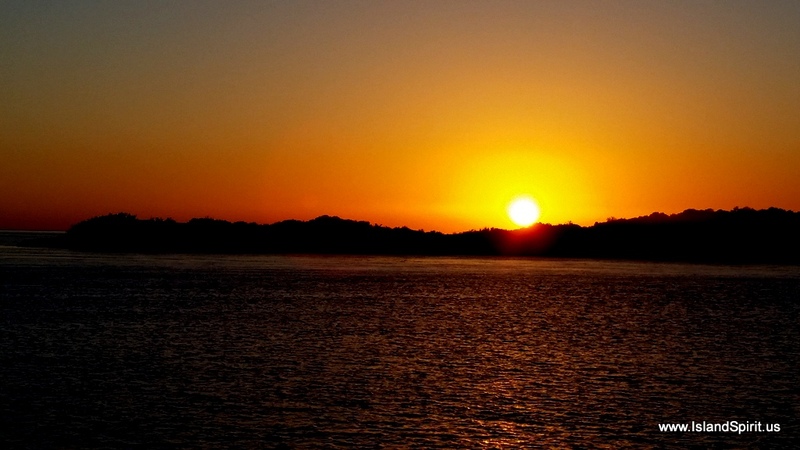 Good night to all, and to all a good night….Thank you for sailing along. 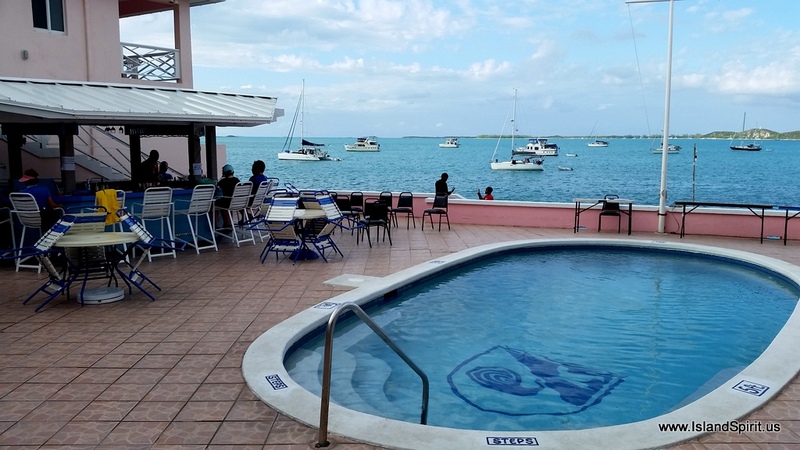 We sailed into George Town, (Elizabeth Harbour) all the way into the Chat ‘n Chill beach to enjoy the scene. 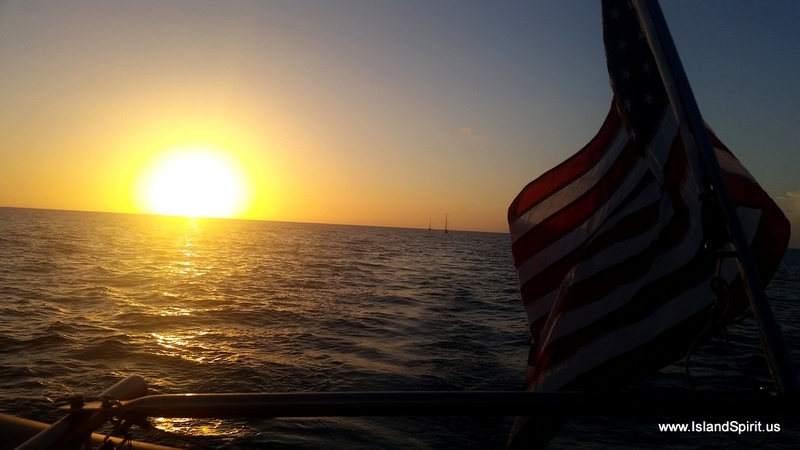 Here we were anchored about 200 yards off the beach with the sun setting over the stern, how exciting. 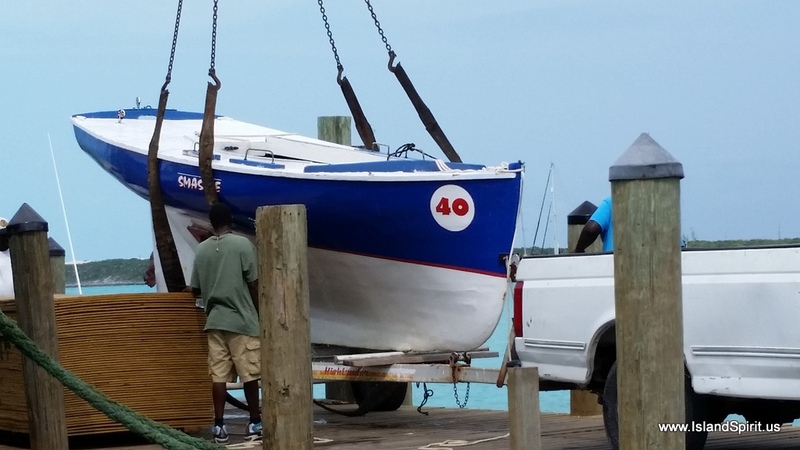 The 37th Annual George Town Cruising Regatta starts this Friday. There are over 300 yachts here, many of which we recognize. We can see why so many cruisers make this harbor THE place to spend the winter. The Elizabeth Harbour is about one mile wide with beaches on the ocean side as well as on the harbour side. 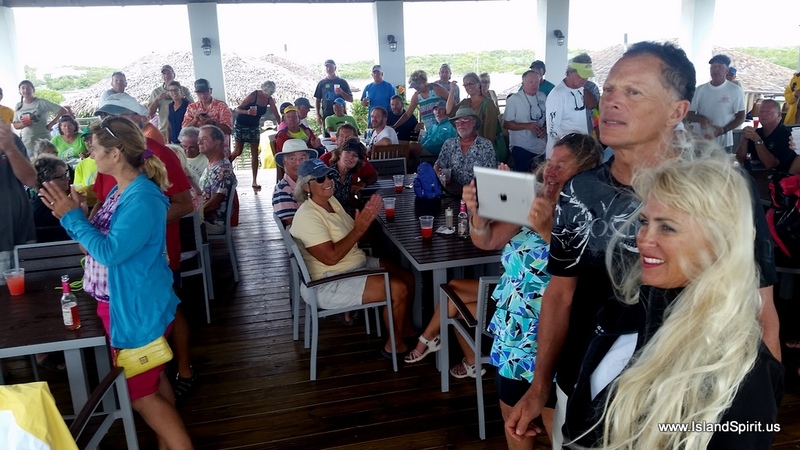 There is the famous Volleyball Beach, home to Chat ‘n Chill beach, where all the boaters dinghy in and hang out, visiting and playing volleyball, yoga, church services, and present talks about boating life and world cruising. There is something fun going on all the time. Looking at the harbour, you will see the island to the east called Stocking Island. This island blocks the normal east trade winds so all the boats anchored along the inside well-protected from the winds. This works well until a cold front arrives which pulls the winds to the Southeast and then the South and Southwest and then finally Northwest. Then the winds blow very hard, at 20-30 knots, as the frontal system passes. This SW, NW winds places boats on the lee shore when anchored at Stocking Island. The beauty of this harbor is that you can easily move to the “other side” which is what we do whenever a front is coming. We move over to Kidd Cove and tuck up against the western shore to be protected when the front arrives. There are many good places to move to all along this western shore. Also on this side is Lake Victoria, which is where town and the dinghy dock are located. 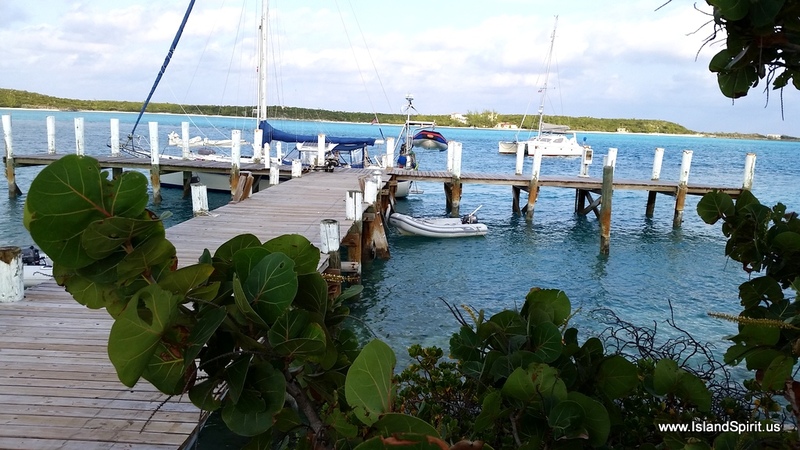 This dock is at the Exuma Market which provides the free R.O water hose where cruisers take on their water for the day. 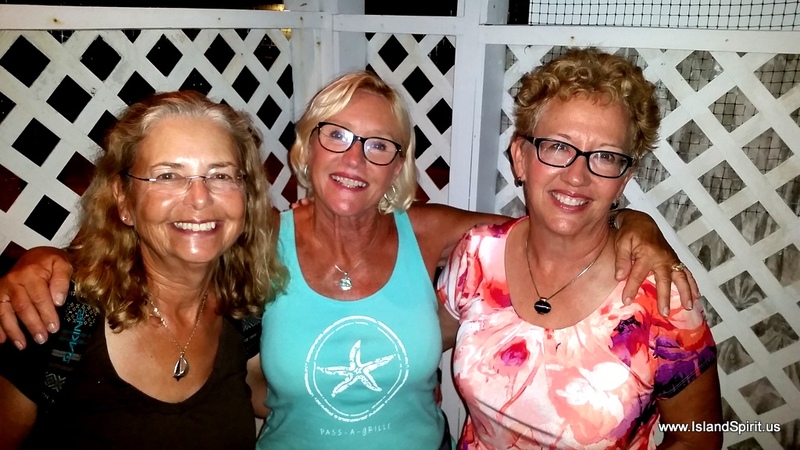 The ebb and flow of George Town is very simple with beach walks, volleyball, visiting with buddies, and living on anchor, all with free water. What could be better than that? Our first night in George Town we were invited over to the beautiful Cobin Yacht named R-CALLISTA owned by Paul and Paula who are the kindest and the most fun people. 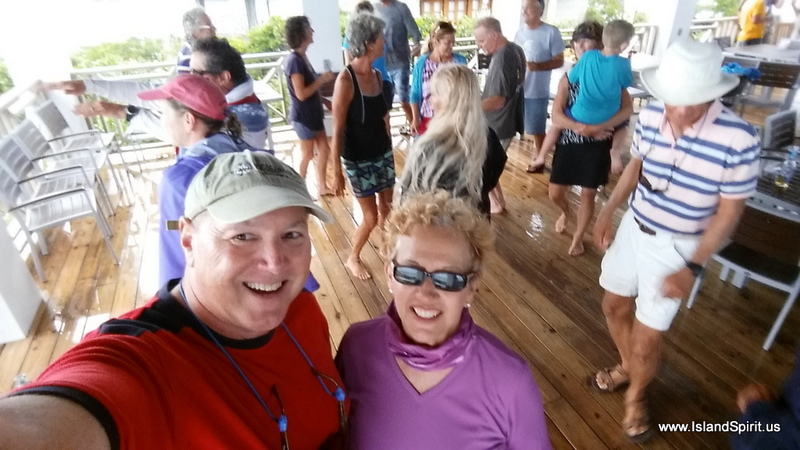 We also picked up Don and Julie of the Annapolis Yacht FIRST LIGHT to join in the visit and fun cocktail party aboard R-KALISTA. Paul and Paula rebuilt this double-ender and I think it is one of the most beautiful yachts out here. 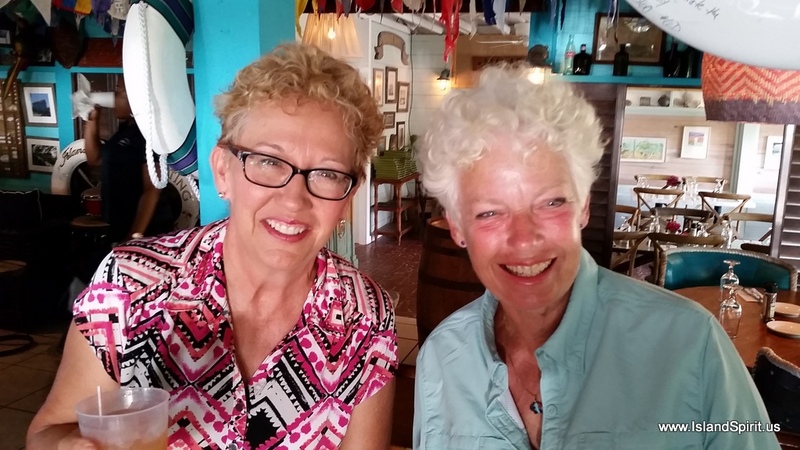 We really enjoyed catching up on their latest adventures. These guys are from Toronto, Canada and we always find Canadians to be so kind and so much fun. 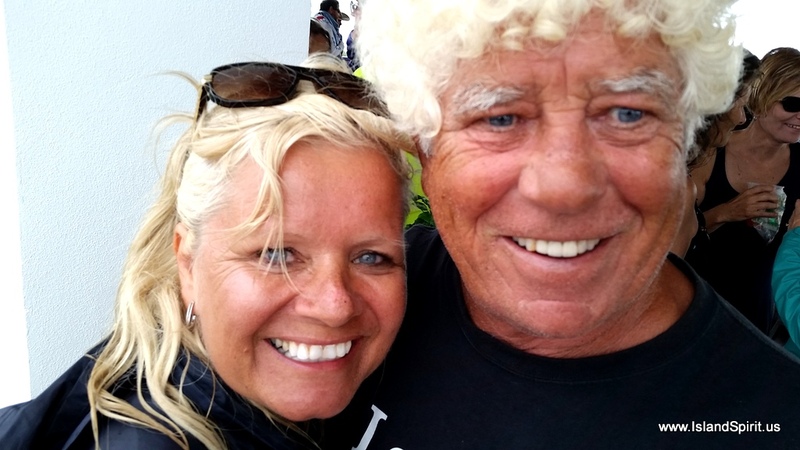 The cruising life is all about the interesting and wonderful people you meet along the way, Paul and Paula are an example of this for sure. 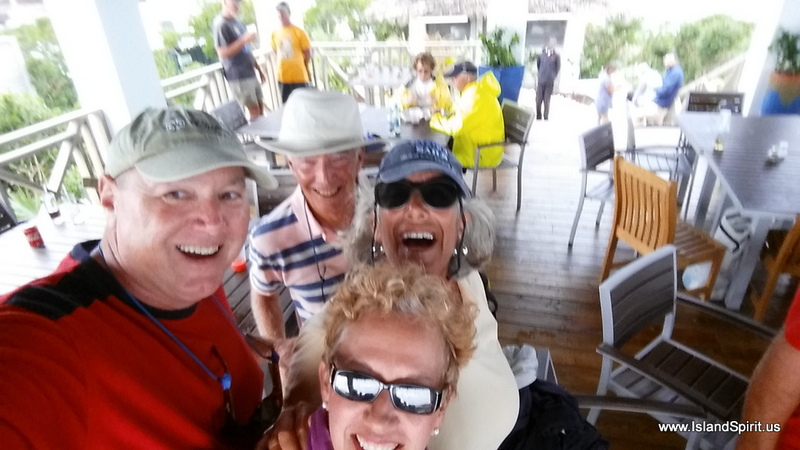 We jumped into the first activity of Regatta, that being the Poker Run which was managed by our Stuart, Florida, buddy, Bill of s/v PROVIDENCE. 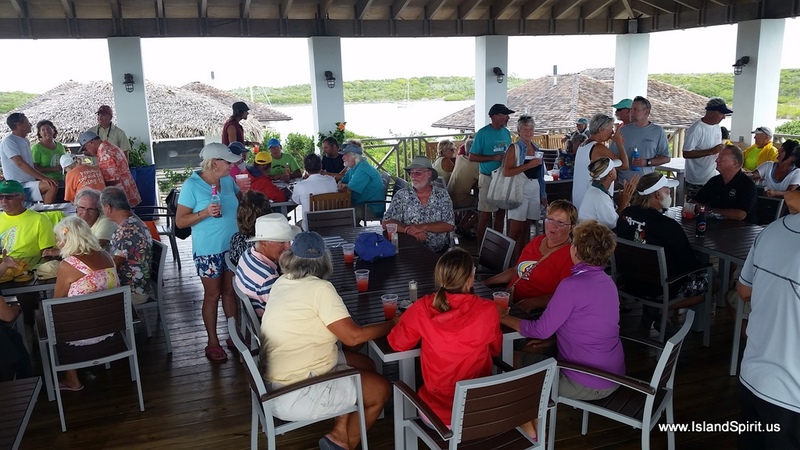 Bill organized a poker run where over 50 dinghies ran the course meeting at 6 different venues and then ending up at the new and upcoming resort on Stocking Island called LUMINA POINT. 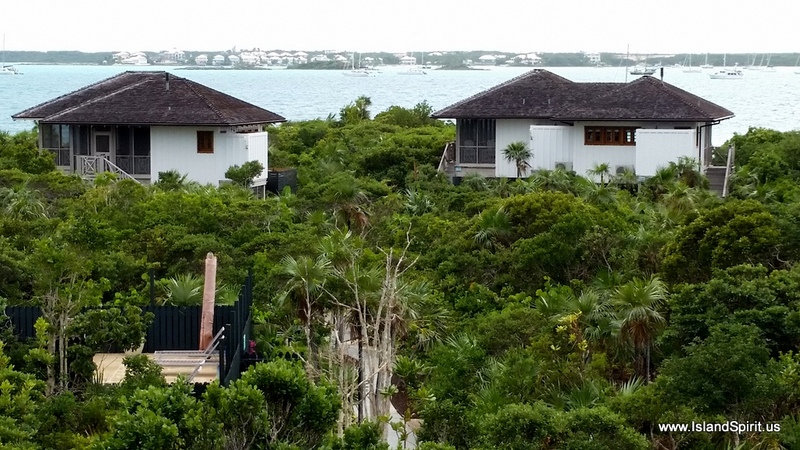 This eco-resort is brand new and is quickly becoming the place to stay in the George Town area. The private elevated cottages over look the harbor and the resort is all eco-friendly with a very large solar plant and R.O. water and collected rain water for vegetation. People are saying that this place is better than any other Caribbean vacation they have taken. It was here that Bill wrapped up the Poker Run with a large party, our own cruiser DJ George and a fun fun dance party. Of course, a squall came through with high winds and rain and caused a bit of a wet dance floor, but it did not stop the party. Everyone had a very fun time. Great job, Bill! 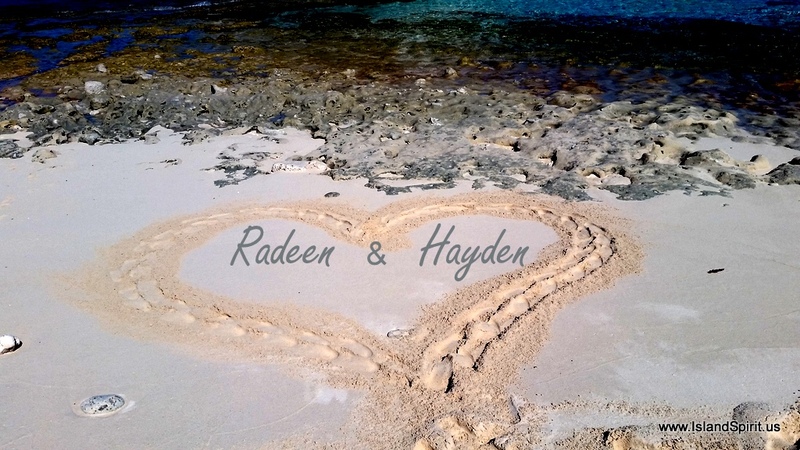 Hayden, Radeen with our new friends,Jeff and Patty sv/AVALON. They own our sistership. IP35-166, we are IP35-165! So, we are George Town based for a couple of weeks as we stage up for exploring the out islands of Cat and more. Once we discover some new islands we will then prep for a direct run to Provo, 200 nm to the Southeast. Our Caribbean Run begins soon. Guess What? 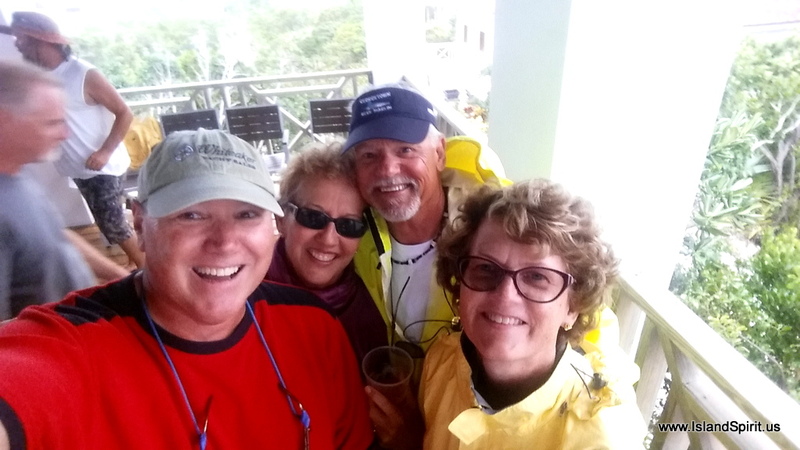 We are closer to St. Thomas than we are to the Florida / Georgia Line, and THAT is why we are heading south! This satellite photo shows our course today, most of it in water over 1500 feet deep. 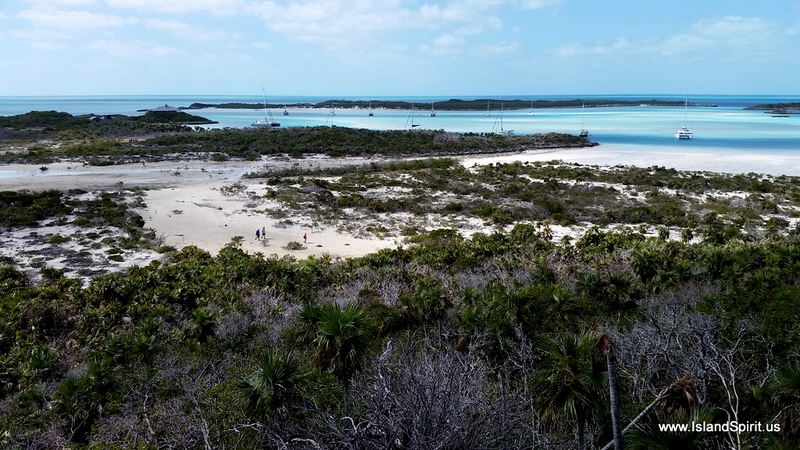 The turquoise waters are the shallow areas and the “wrinkles” are enormous sand bars. At 0815, we anchored up with Sharon and Craig of IP38 Bonavista, for a fantastic sailing day of 43 nautical miles. 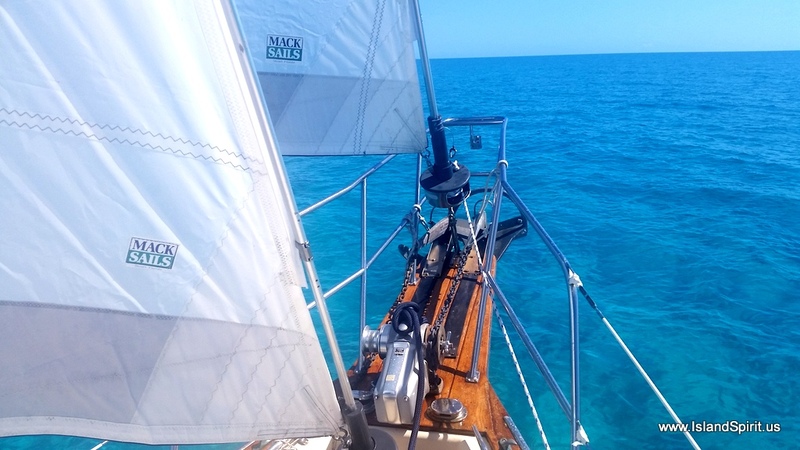 Our 45 minutes of engine time included getting off anchor on the Little Farmer’s sand bar, raising the main sail and motoring out Farmer’s Cut from the banks to the ocean. 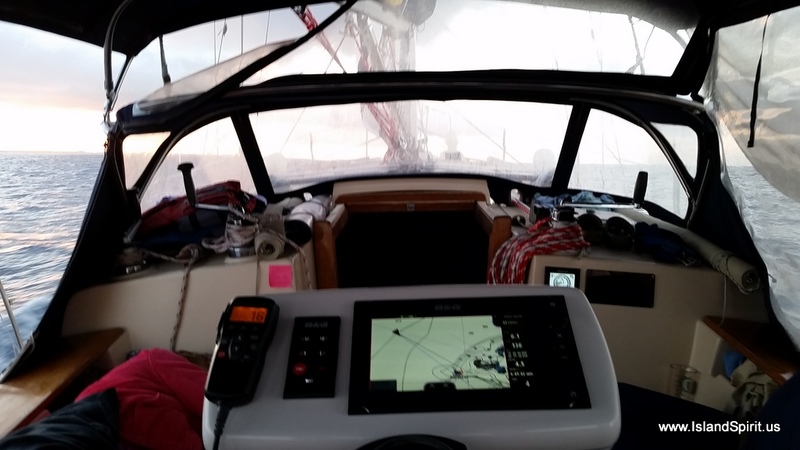 We immediately shut down the engine and rolled out the jib, setting a course for George Town 40 nm south east. 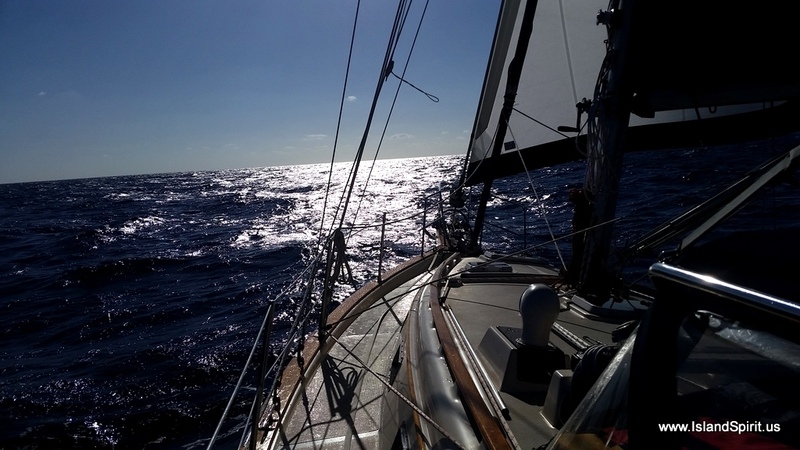 Winds were steady at 13 – 16 knots from the NNE, giving us a beautiful beam reach. 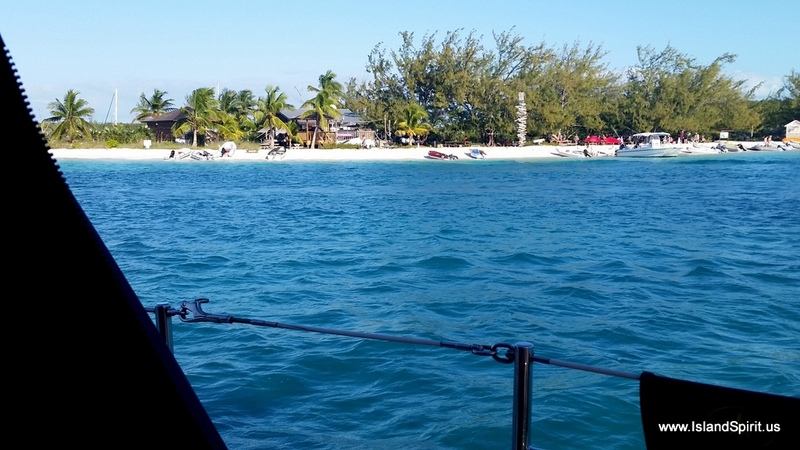 As we approached Conch Cut, the entrance to George Town, we were able to sail straight into the cut and then reach all the way into the harbor. It was fun sailing directly to Chat ‘n Chill. 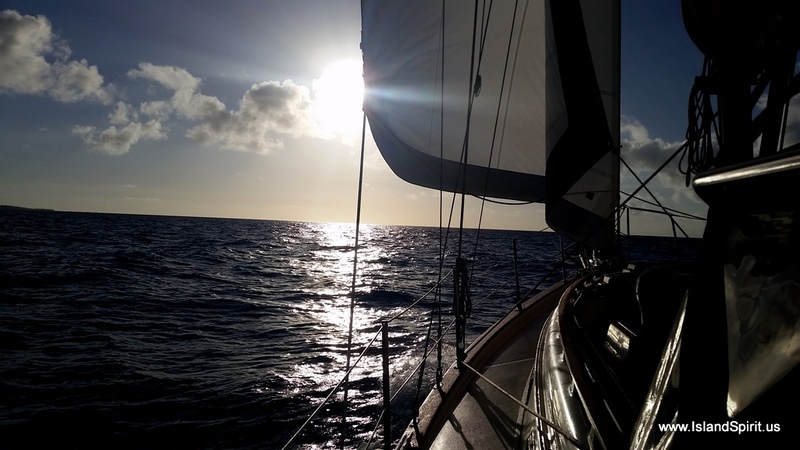 We dropped sails, started the engine and motored up towards the beach, setting our anchor at 1600 in 10 feet of water. The 55 lb Rocna set quickly into the sand, concluding a great day of sailing. 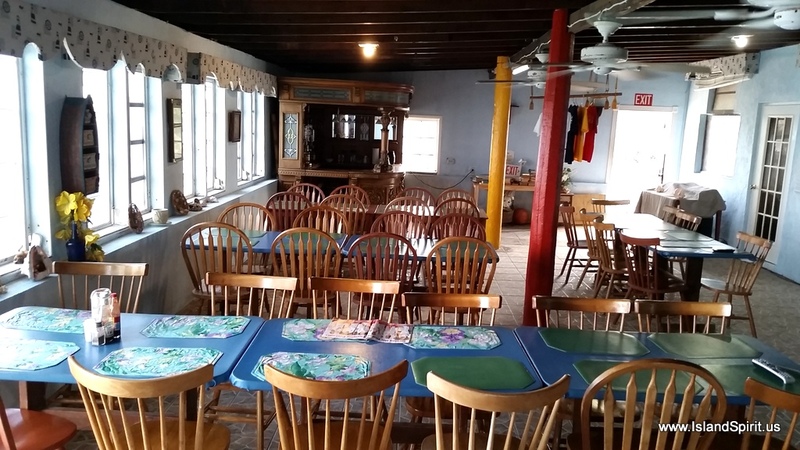 Now we can take in some of the activities here and visit with cruising buddies. George Town looks like there are far more boats here that we have seen in our 3 previous visits. We heard there may be over 400 yachts here for the Regatta that starts Saturday. 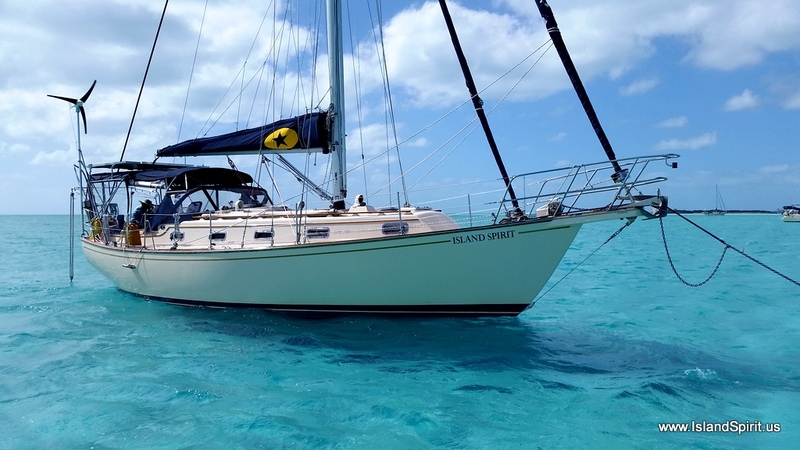 We plan to ride out the next weather system here on Wednesday/Thursday and then possibly Friday/Saturday sail to Cat Island and discover something new. 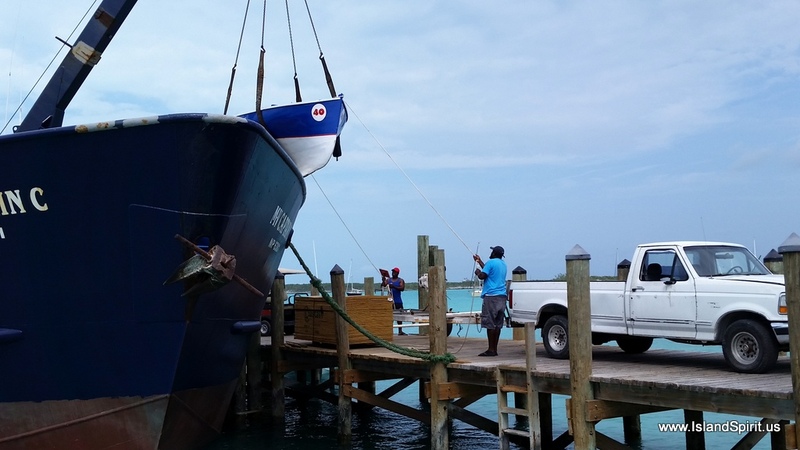 For now, welcome to George Town, Exuma! Here are the sailing photos of the day. Setting sail for George Town. Our new B&G custom screen displaying the 3 apps that I chose. 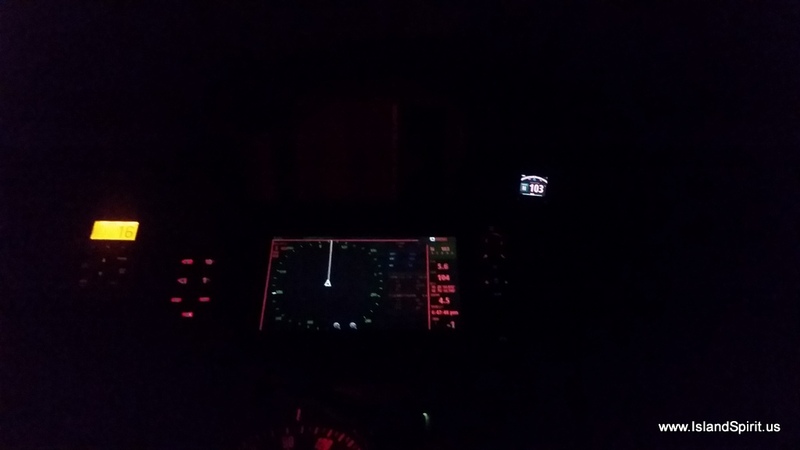 L to R: Sailsteer, Autopilot and Instruments. Sorry it is not more clear. There it is, Chat ‘n Chill, out the porthole. Blue water and palm trees from our boat. Our next thoughts are about the weather. 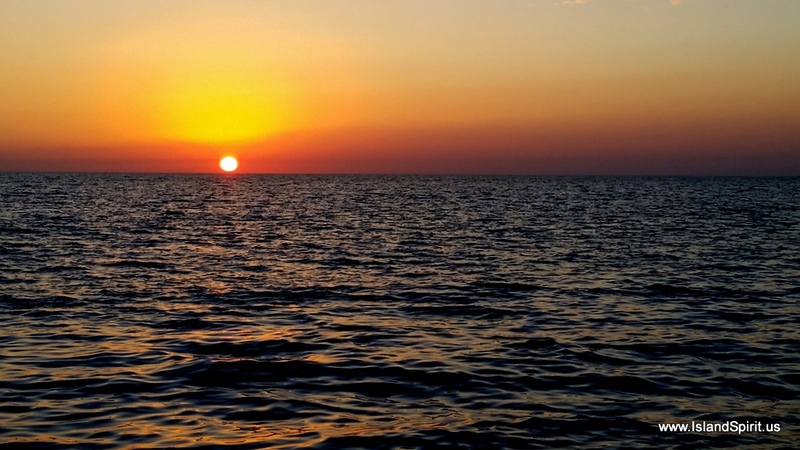 Our professional weather man, Chris Parker, has presented several options for Wednesday/Thursday ranging from a full blown low developing with clocking winds to 35 knots and squalls to 50 knots or possibly only SE winds at 20 knots. We will have to deal with this on anchor with all 400 boats. We will move out to where we can lay out more chain and have plenty of room to swing. 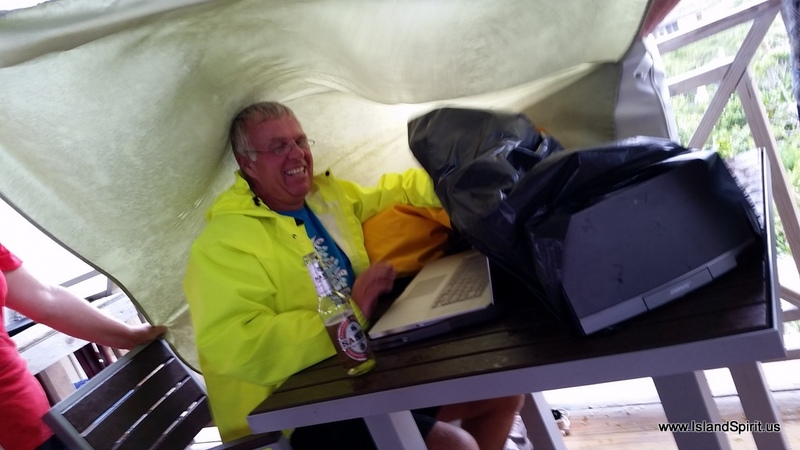 For tonite and tomorrow, there is only 15-20 knots of wind, so we have time for some fun! 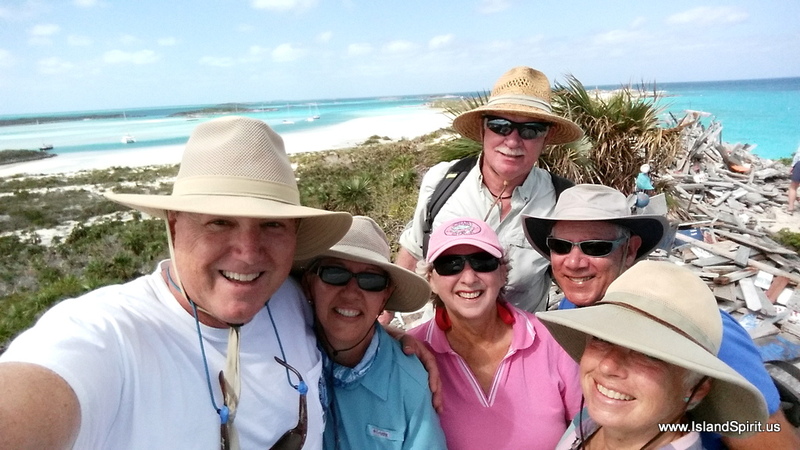 We are lost in the beautiful cruising life of the Exumas in the heart of the Bahamas. 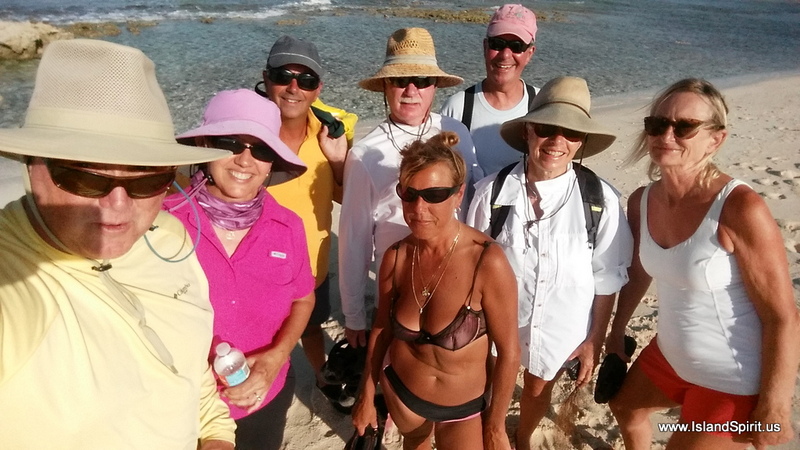 Days are moving between beach walks, snorkeling, swimming, trail hikes, visiting with boat buddies, talking about routes and places to go, on and on and on. 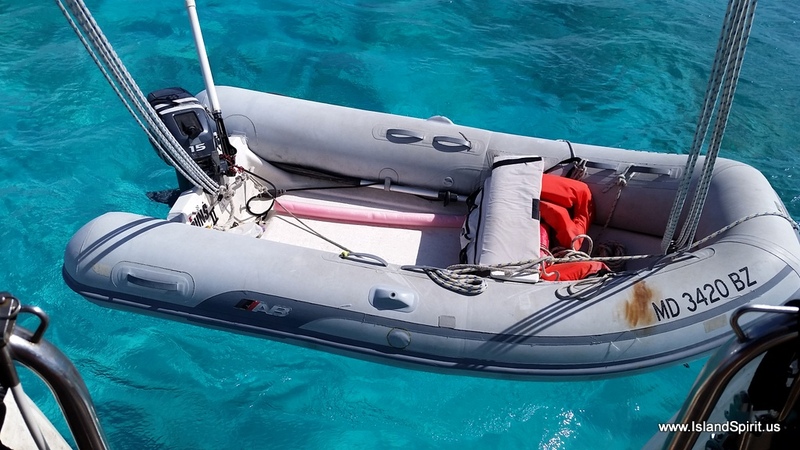 All the while surrounded by the most beautiful water of teal blue, crystal clear where we see the bottom in 20-25 feet when we drop the anchor. We can not imagine a more beautiful place to sail. 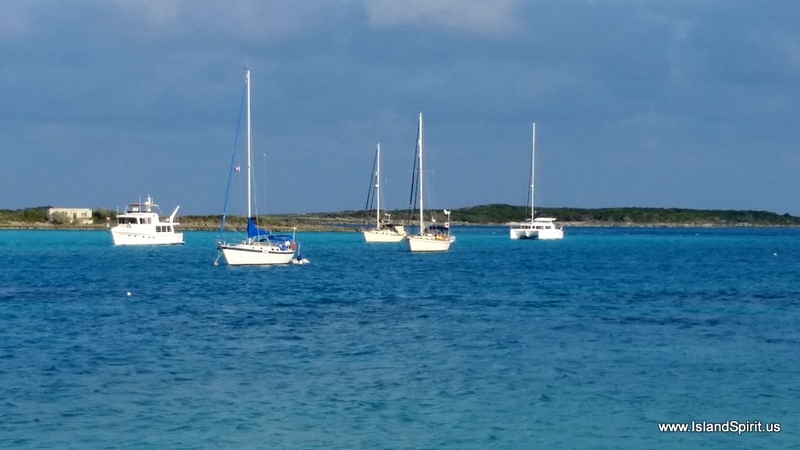 Yes, we are outbound from here to the Eastern Caribbean, and we know that is beautiful as well, but we are a bit sad to sail out of the Exumas as this is the most beautiful place we have ever explored. But we need to explore onward and we need to discover new harbors with Island Spirit, so onward south. 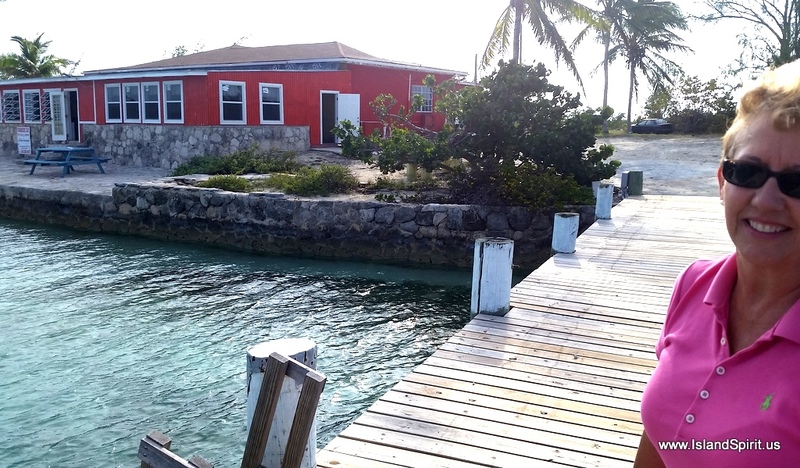 We have spent the last week in Cambridge Cay, Staniel Cay, Black Point and now Little Farmer’s Cay. 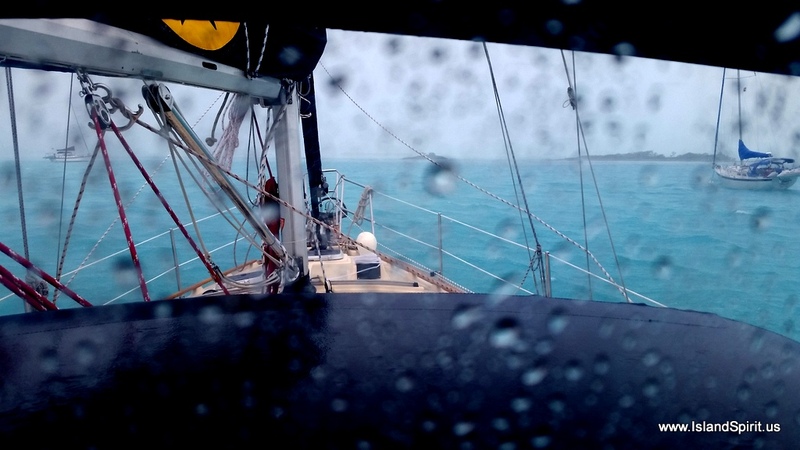 We are pushing south to George Town because the weather forecasts have been the most confusing of all times. Chris Parker is offering up 4 situations from calms to deep low pressures. Then the Grib files show no big deal, just 15-20 maybe 25 knots east winds, typical. So with this confusing forecast, we are making a run for the safe harbor of George Town where 300+ yachts are anchored. 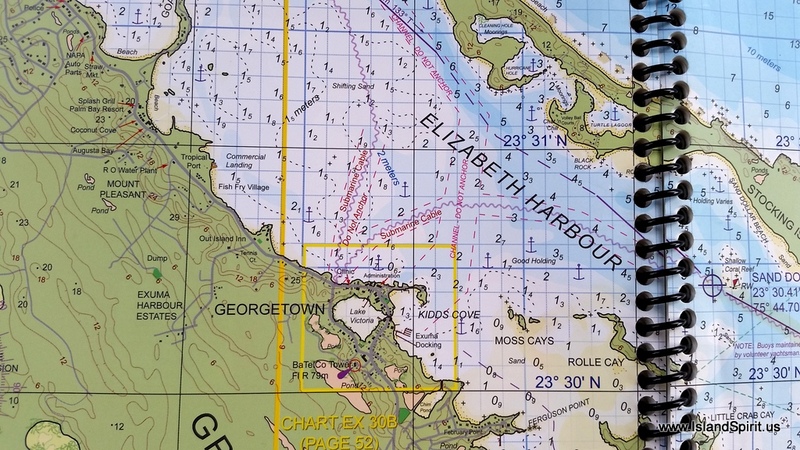 Then next week it is the George Town Regatta and we plan to sail over to CAT Island where we have never been. We hear this is a great island to meet the locals and to explore. 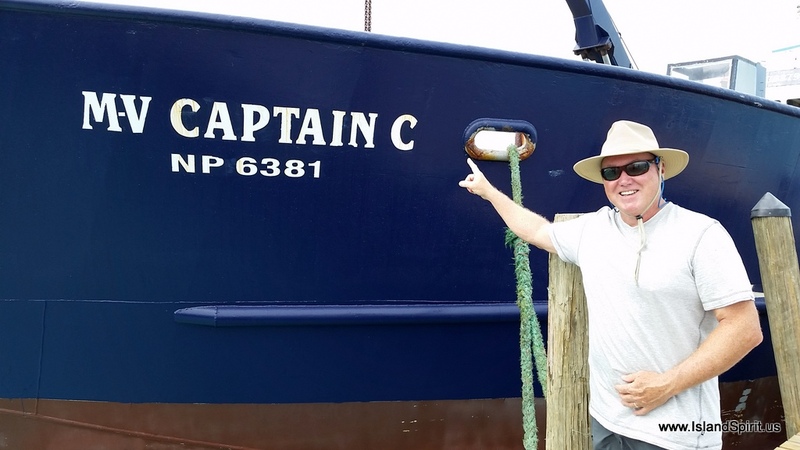 We hope to sail out there and learn all about Cat Island. 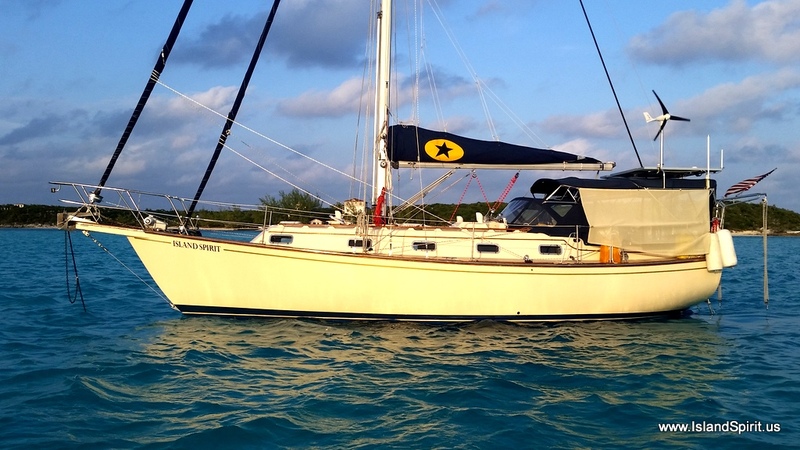 Then we plan to sail back to George Town and prepare for our run to the USVI. We will need to fuel up and change filters and service the engine. Then plan out the final run and look for a good weather winter to run from George Town to the Turks and Caicos and then south to the Dominica Republic and on east to the US Virgin Islands. 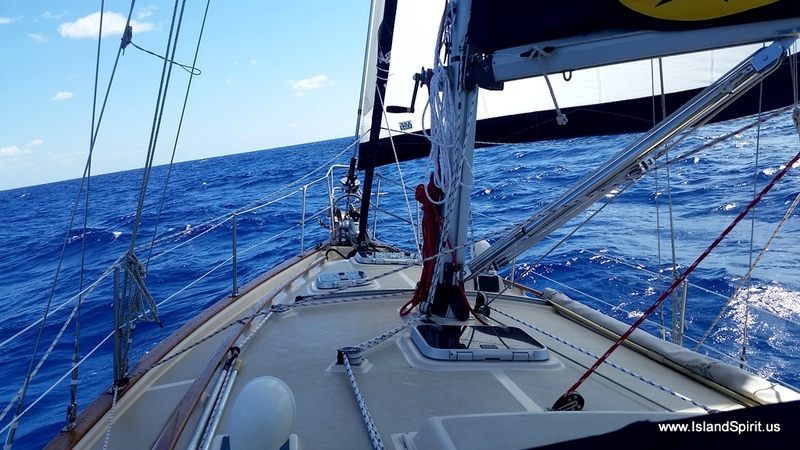 We have leaned that it is 200 nm to the Turks and then about 150 to the DR. Radeen and I are used to running 240 nm from Cape May, NJ up to Block Island, RI, so these runs are not large, just new to us. We are getting excited to head south. Every year, in March, we have turned around and headed north to Abaco where we usually send April, then in May we run the USA east coast to Rock Hall, MD. This year, we will take that time and run it south and we should end up in Grenada. That is the plan. We will see how far we get. One thing is for sure, we are not heading north, we are heading south. For now, we just need to get to George Town. One leg at a time, that is how we are doing this. Here are tons of photos of the past week…. It says I am in 3 foot water on a sand bar. NOPE, it is not here. 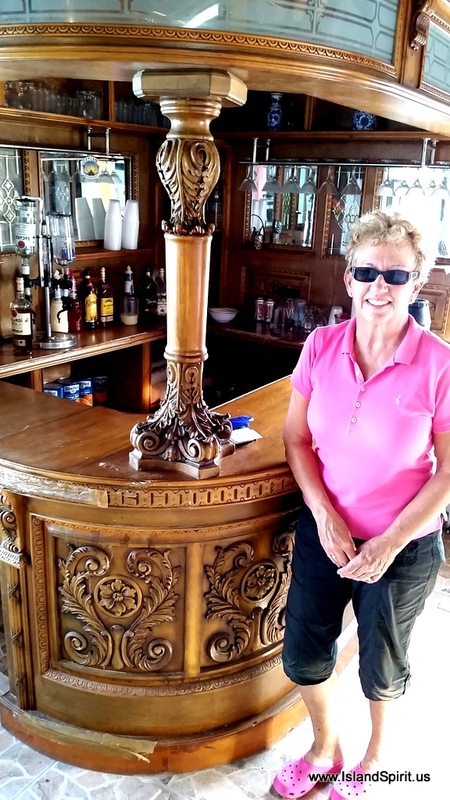 We meet Roosevelt Nixon, who built the yacht club 28 years ago. So, life is good aboard Island Spirit, we so doing well, we are moving south, and we are loving the Watermaker. We are now running it 2-3 hours at a time every other day. We have all the water we want. What a treat in the Bahamas. 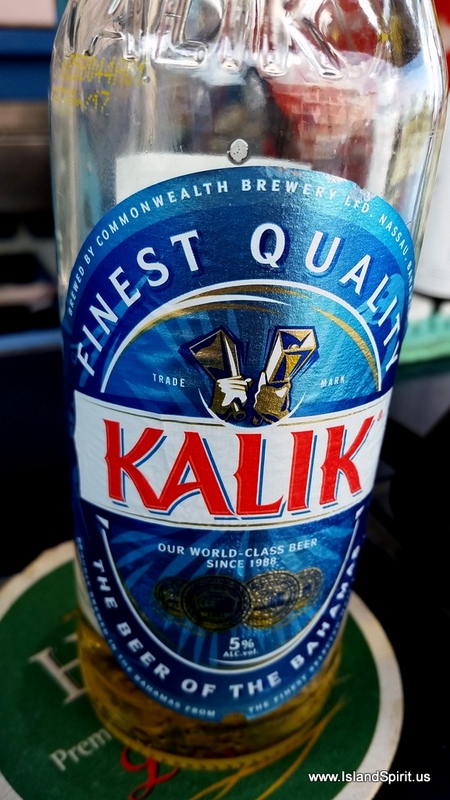 Next stop….George Town. 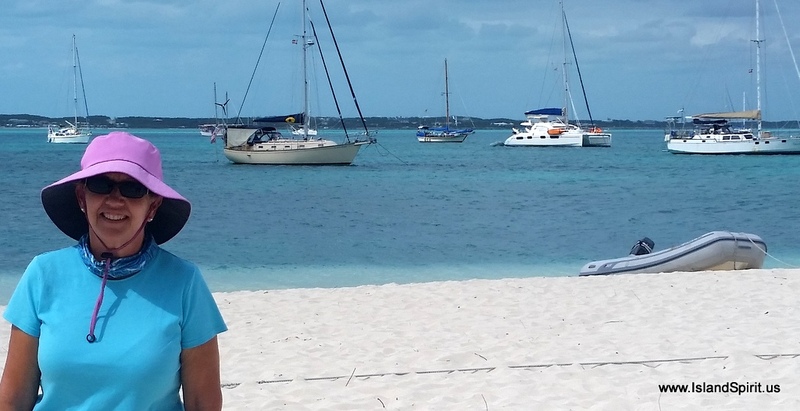 Happy Valentine’s Day from Cambridge Cay in the Exumas Land and Sea Park which is the most beautiful place on earth. We think this is even better than Warderick Wells, but you will need to sail here yourself and decide if this is true. For now, simply enjoy these photos which need no explanation, just take in the beauty. click this photo and look left and right, UNREAL….our own private beach and there are about 6 of these at least. 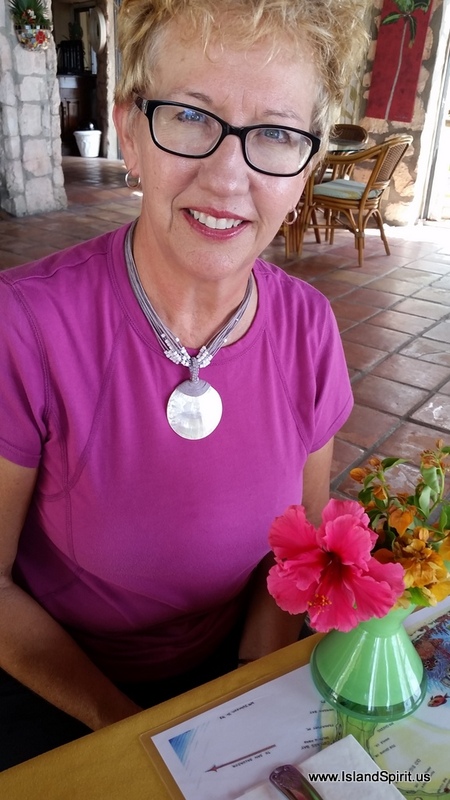 Thinking and praying for Kathy and Eric as Kathy powers through Ovarian Cancer treatment, you are in our thoughts daily…. Cambridge Cay is beautiful and here is where it is located. 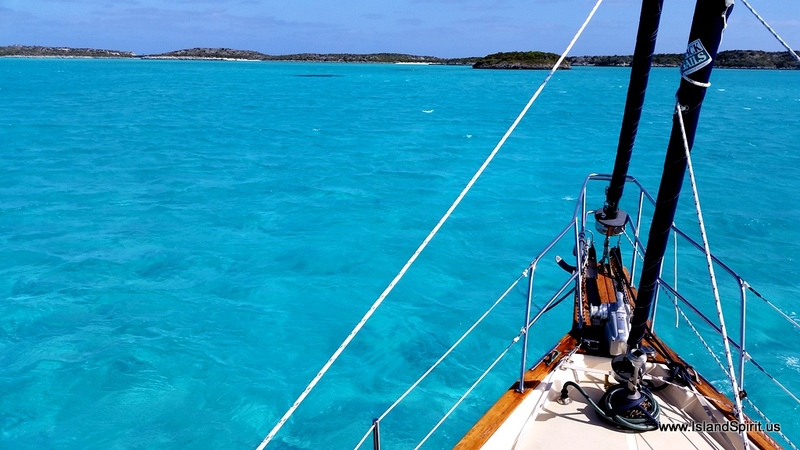 Sailing in the Exumas is always a great experience because the winds are usually from the East and courses are usually North and South. This means a comfortable point of sail called “reaching” to sail from destination to destination. 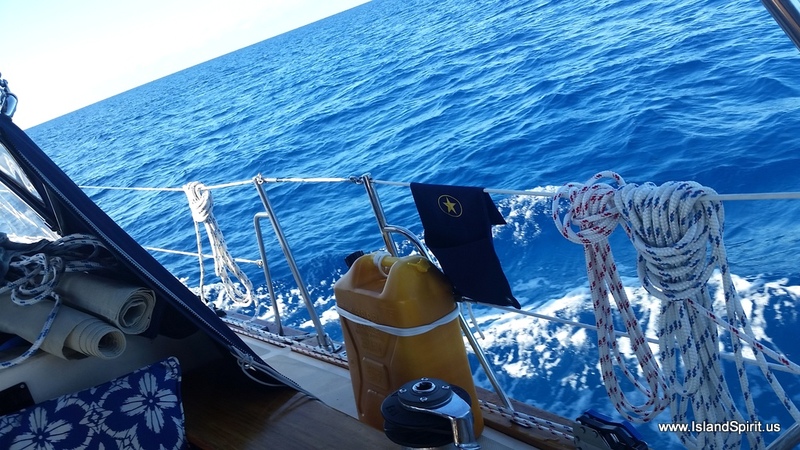 Today, we picked up the anchor at Warderick Wells, Emerald Rock, and within 5 minutes we were under full sail. 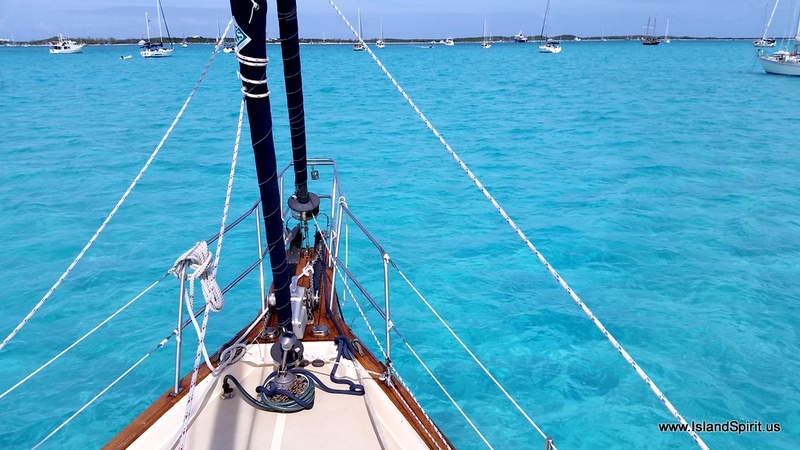 As we turned the corner and set up our course south to Staniel Cay, we noticed that our new sails seem more powerful. 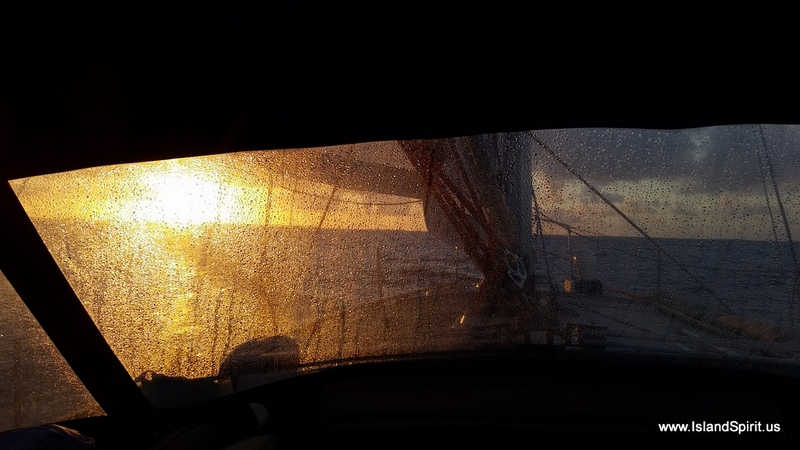 In 18-20 knots of close reaching we needed to drop in the first reef on the main sail. 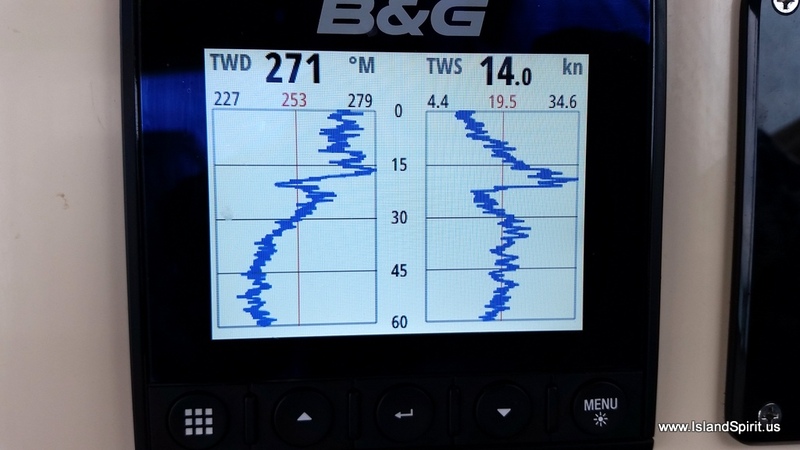 This gave us a chance to test out our new boom arrangement and new single line reefing system under full wind loads. 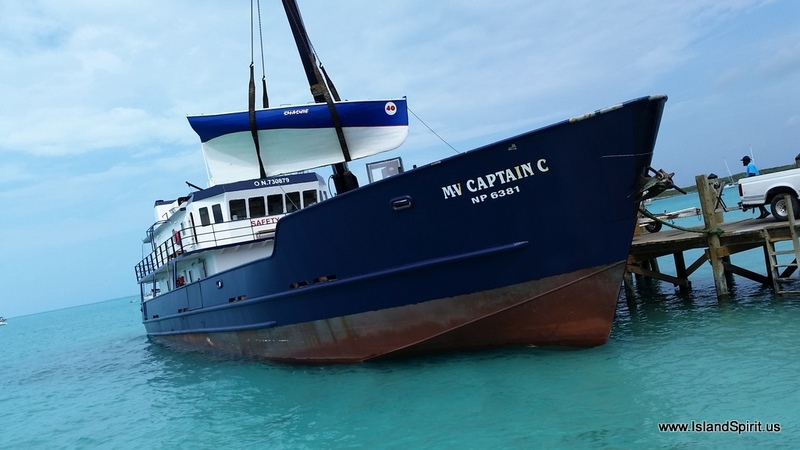 It worked well and once the reef was in and the course was set, Island Spirit sailed even better. I am never disappointed in the way Island Packets will sail. They actually sail upwind very well and they love to beam reach in 15-20 knots. B&G Zeus Sail Steer is really cool gear. 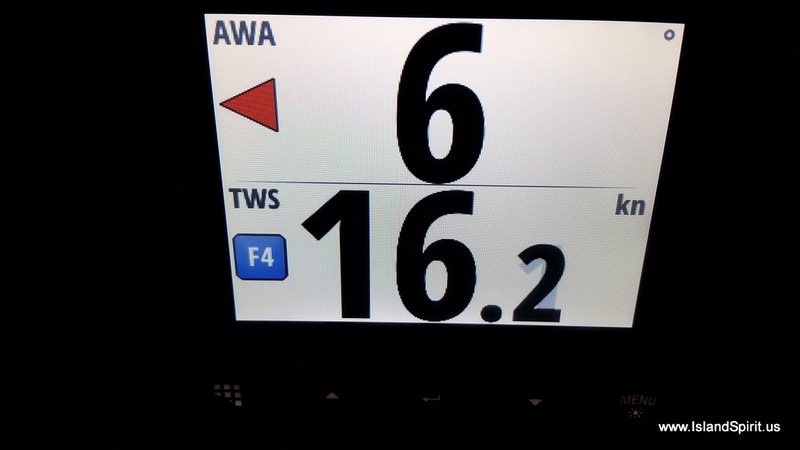 We also used this sailing time to keep learning our new B&G Zeus2 Sail Steer and the autopilot wind vane steering. 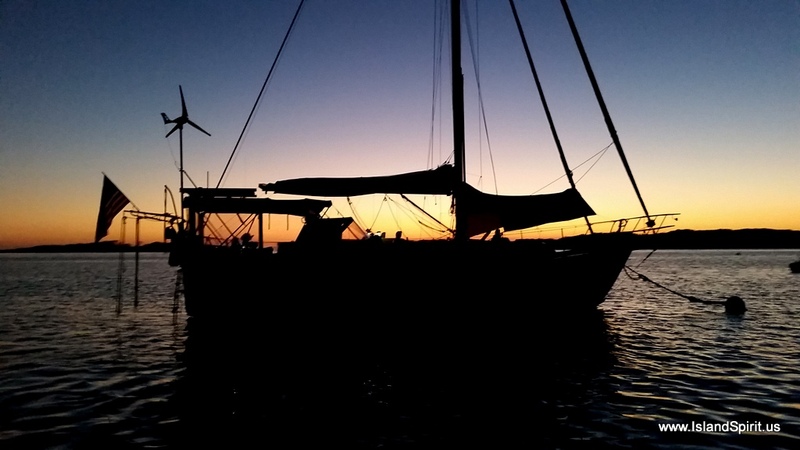 We have sailed this boat since 2002 on wind vane steering and we almost never, ever hand steer this boat under sail. 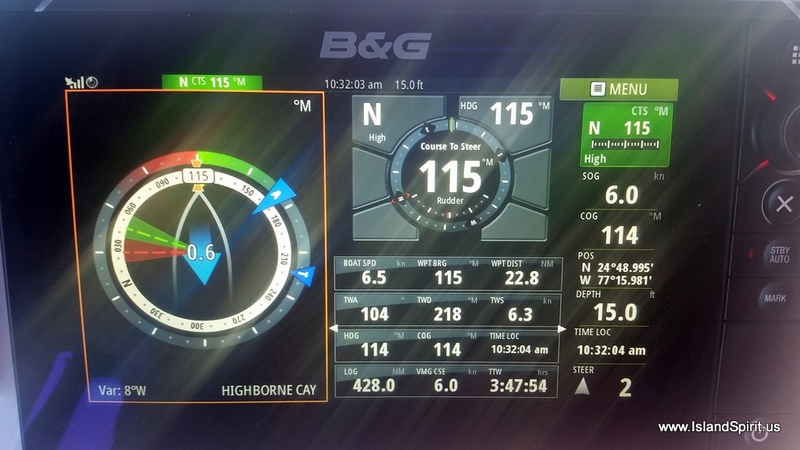 The B&G gear and autopilot will process the wind shifts and will head up or fall off far better than a human can ever do. Island Spirit sailed 99% of the way here today and her last three tacks were close hauled into the harbor. Radeen and I were tired when we got here, but we are gaining faith and confidence in this new electronics package and its capabilities. Our last B&G system we had 100% trust in. At this point, we are at 85% due to a few very minor glitches. Overall, the new B&G gear IS far better than the old gear and we are very happy with the upgrade. 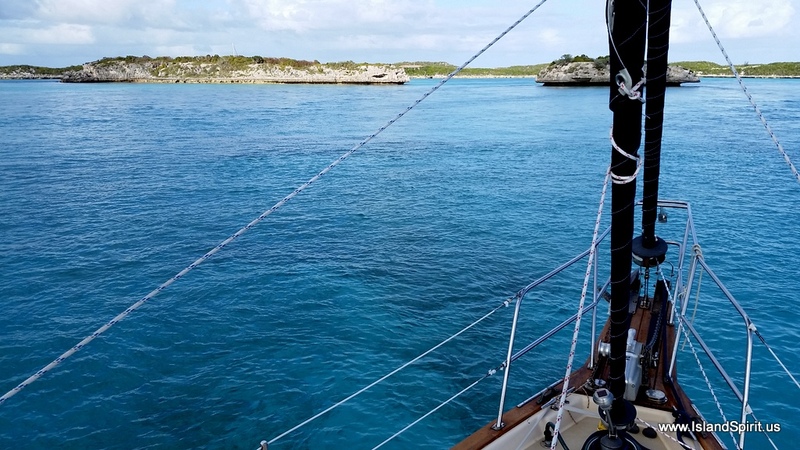 After dropping sail off Staniel Cay, we motored around our buddy boat Crealock 34 NEVERLAND and decided that there was not enough room next to the yacht club so we moved around to Thunderball Grotto and dropped the hook just west of the grotto in 10 feet of water. We launched the dinghy and headed into shore for a nice walk around town and we stopped in all three stores to say hi and we bought a small item from each store. 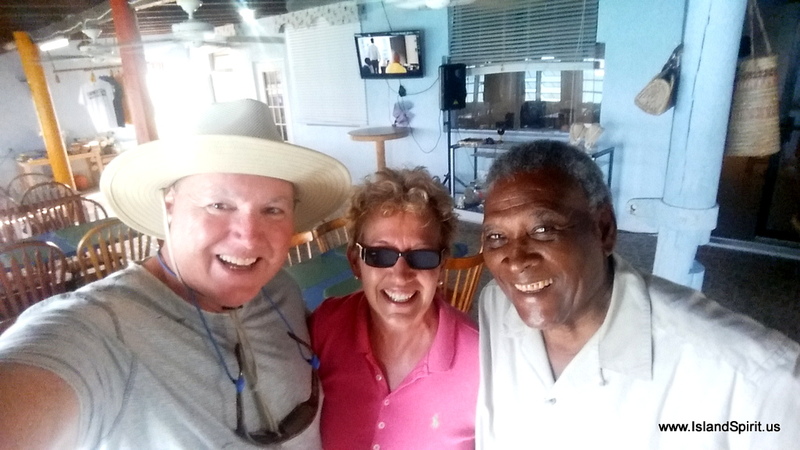 Bahamian people are so kind and so nice, this is a great country to visit. Here are some photos of the day…. Nurse Shark Feeding at Staniel Cay, look how tame they are! 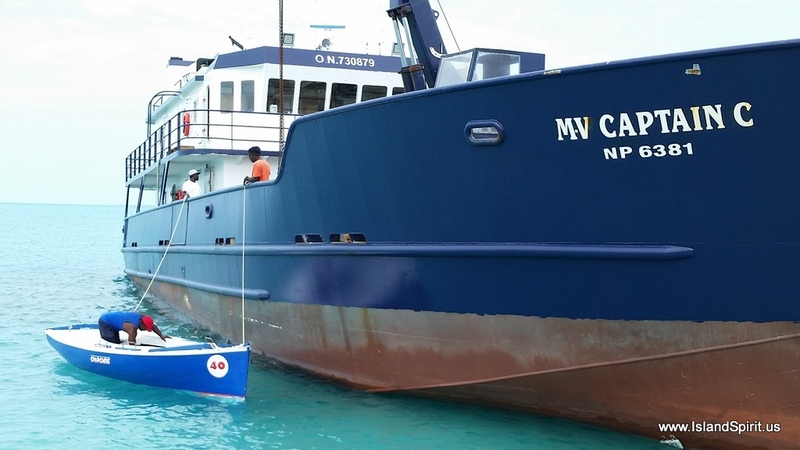 The next stop will be back north to Cambridge Cay where we plan a few lay days to work on teak, also to go snorkeling and to break out the dive gear to look at the bottom and practice. We have another front arriving Wed night into Thursday so we plan to take that one in Cambridge Cay. Remember we are running a live calendar of our plans and we are also running live tracking maps of our travels. Thank you for following along, we really like knowing you are here. 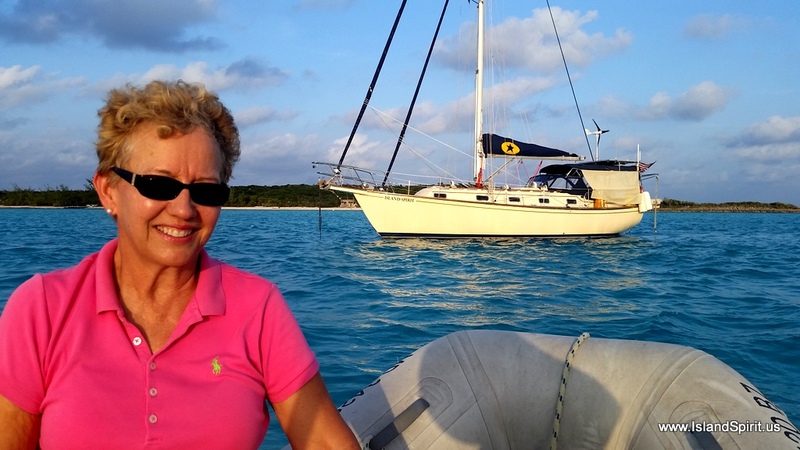 We sailed on a perfect beam reach from Highbourne Cay south to Warderick Wells, which is the center of the Exumas Land and Sea Park. To us, this one of the most beautiful places on earth. 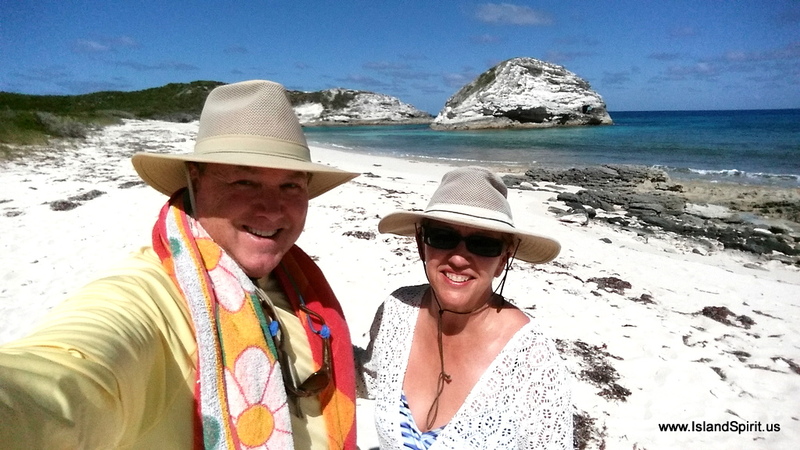 The deserted islands with crescent beaches lined with rock edges makes it a dream to explore. 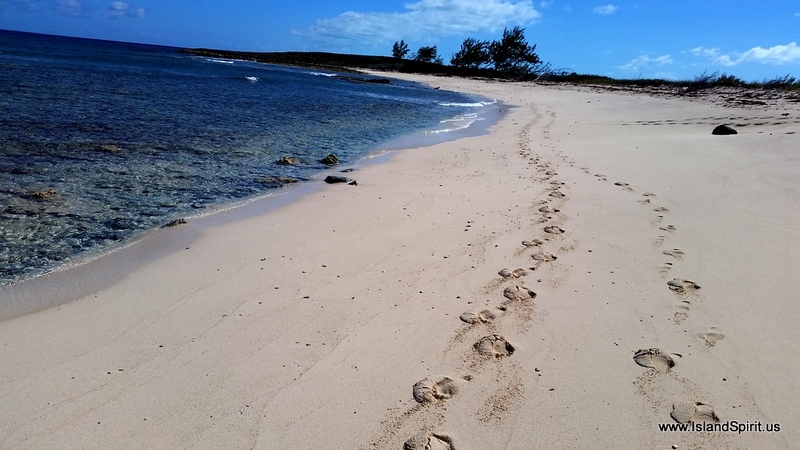 Walking trails traverse over sharp jagged rocks that look like the surface of the moon and wind through hard sand tidal flats with waters running out to sea. 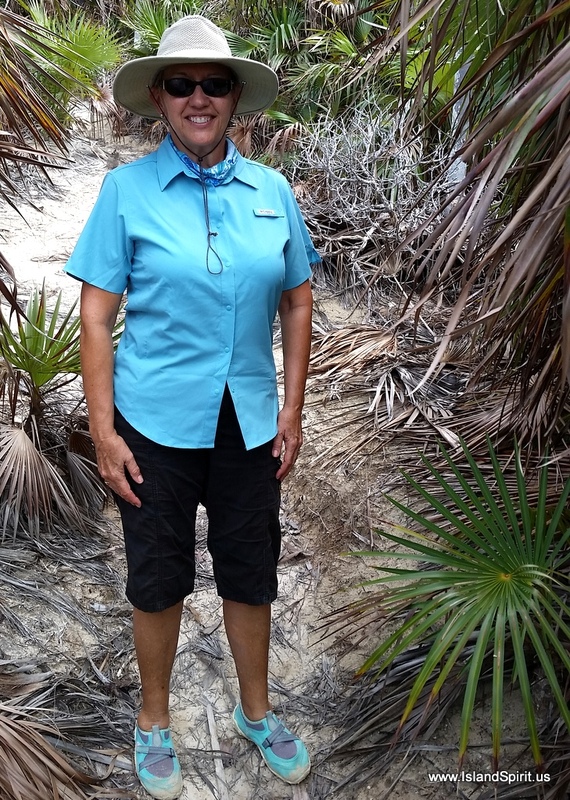 The trails lead you to the park office and more beaches and also up to the top of Boo Boo Hill, one of the the highest points in all of the Bahamas. All of these features help to make Warderick Wells a perfect place to celebrate Hayden’s birthday. 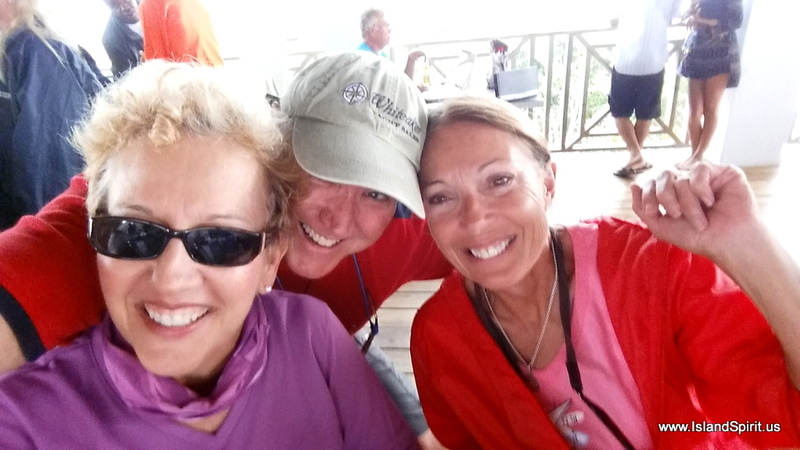 With our buddy boats IP380 PLAN SEA, Jim and Loretta, and Crealock 34 NEVERLAND, Jim and Cynthia, we shared a delicious meal aboard Island Spirit, laughed and had a great time. Sharing places like this with friends makes it even more special and more memorable. Make sure to add Warderick Wells to your cruising bucket list. 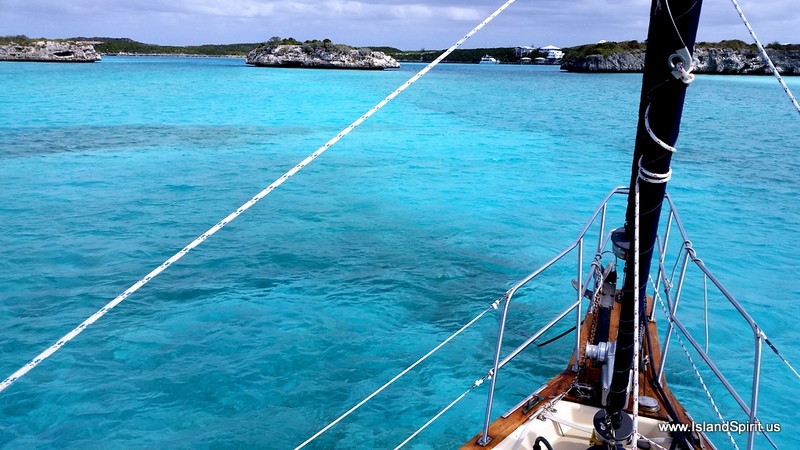 Look at the following photo because THIS is why we sail to the Exumas, the water is so beautiful…. The winds from this frontal system, which is causing SNOW up north at home in PA is unusual in that it has zero West or Northwest component to the strong winds. All the wind has been from the North and the Northeast which makes for a great anchorage off Emerald Rock on the south side of the park office. So we dropped the hook here, as all the mooring balls were taken in the north field, and we used the dinghy to reach the beaches and hike the trails. Below is the approach across the tidal flats from Boo Boo Hill as we look west towards the park office. The birthday dinner aboard was baked chicken with cheese and artichoke hearts, walnut topped green beans and home made “Hayden bread.” Then to top it off Radeen made her own invention of a Jerry Garcia Chocolate Cherry Cobbler because Hayden loves cherry and chocolate flavors. This was a great meal and a very fun night celebrating with friends while on anchor in paradise. We can not think of a better day! Loretta wrote an acrostic poem using the letters of my name…. what a great surprise! Thank you to Jim and Loretta and Jim and Cynthia for making my birthday so special. 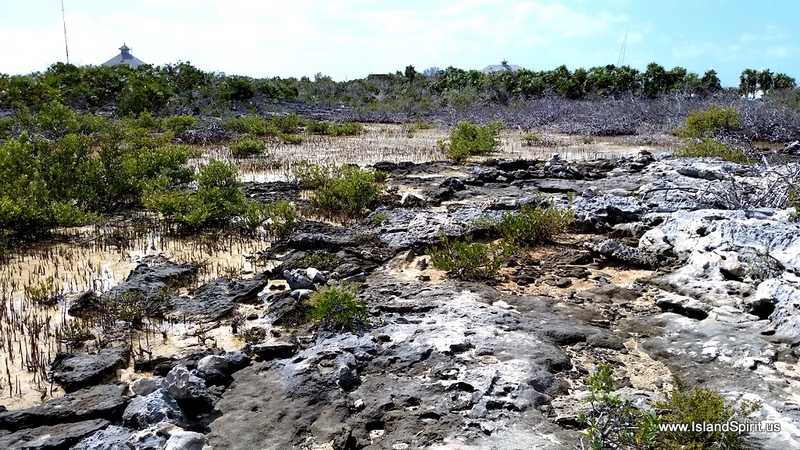 Another reason Warderick Wells and the Exumas are so different is that there is very limited internet and there are zero TV channels, nothing. Imagine being in a location where there is no cell phone coverage unless you climb up Boo Boo Hill and hold your phone up in the air. You have no TV broadcasts, none, and cell towers do not reach here. 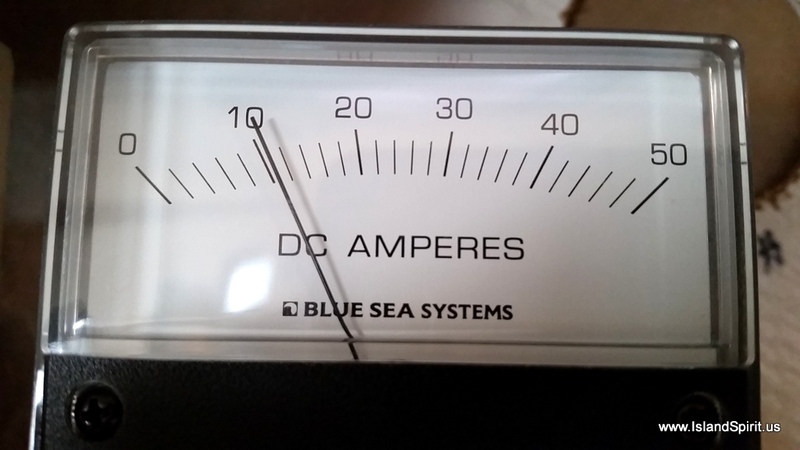 I am blogging this via my cell which is in a power booster cradle connected to an outside 3G 4G antenna booster and I am still only getting 1/2 a bar of signal that comes and goes. I also am up at 4:30 am to use the cell tower when fewer people are on the tower. Still I can hardly connect, and that is very, very rare in this world. One more aspect that is making this trip interesting and different is our watermaker. Since leaving Miami, we have made water every day. We run the unit as planned for about 1 to 1.5 hours a day and that makes 8 to 12 gallons. For the first time, we arerunning it on anchor at Warderick Wells totally off the wind machine. 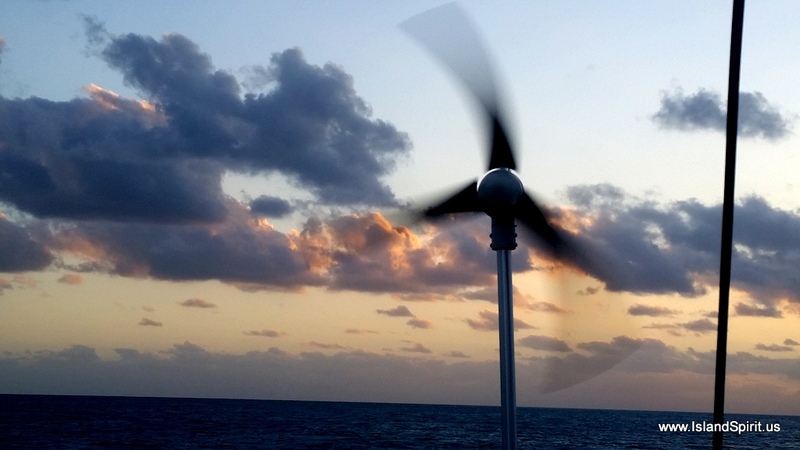 Imagine making drinking water from saltwater and wind power alone. Now THAT is a very cool thing to do! We are having 15-20 knots of wind and the battery bank is full at 13.3 volts this 4am. While making water, the bank never dropped below 12.8 volts.The MK450, Marine Kinetics wind turbine is fantastic! From here we will sail south to Staniel Cay Yacht Club and get our “town” and “civilization” fix for a day or two and then we will sail back north to the park to Cambridge Cay where we will do some snorkeling and prepare for the arrival of the next cold front which will have WEST winds…maybe. 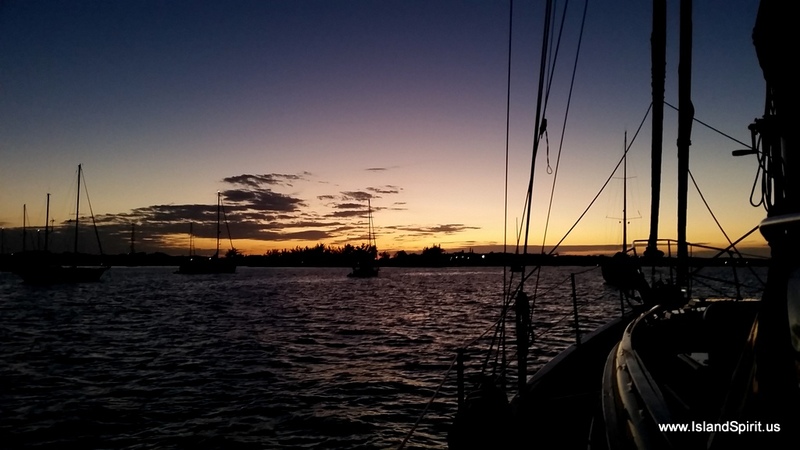 We spent one lay day at Bimini Sands Marina in South Bimini to allow the East Winds to shift to SSE as forecasted. 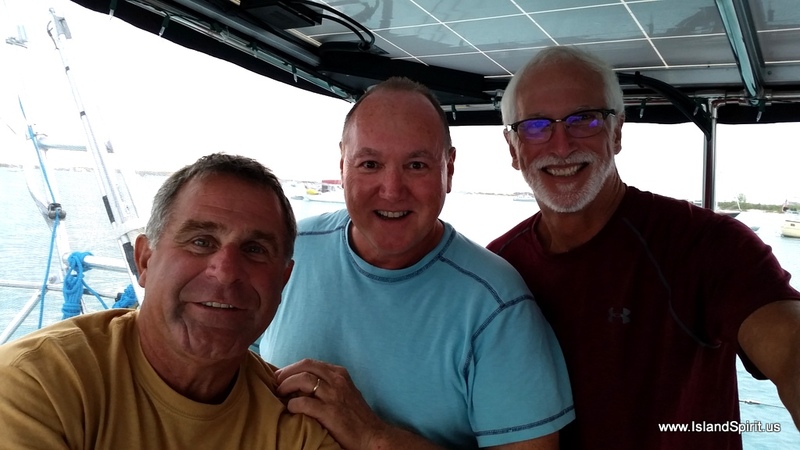 This gave us time to shuttle down to the airport in the AM to check into the Bahamas and get our cruising permit and fishing license. All of us were granted only 90 days, but asked if they would kindly allow us 120 days and they did. 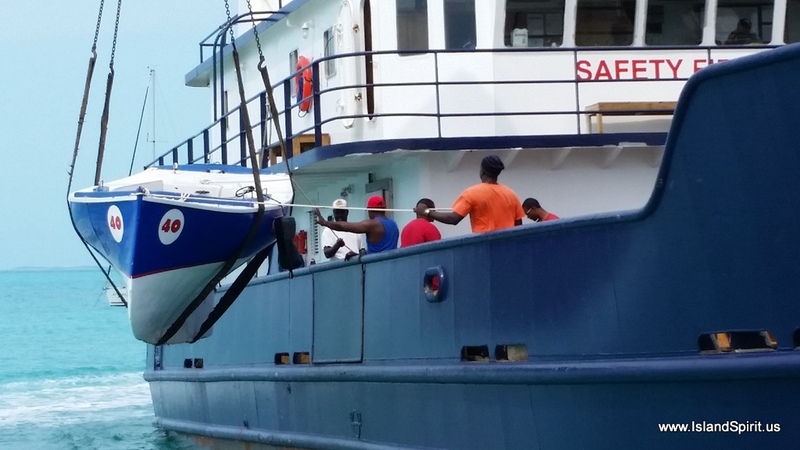 After customs, we washed our boats because non of us had been to a dock for many weeks. 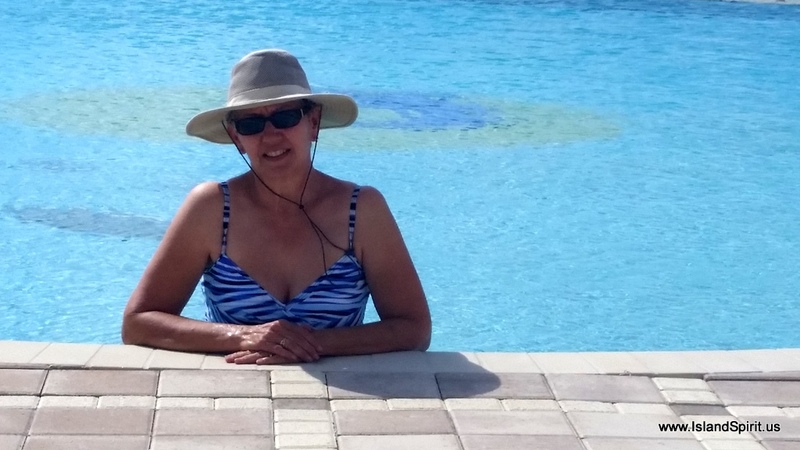 The day was spent with the teams going to north Bimini to BTC for SIM cards for their cell phones and Radeen and I stayed back and did a few network jobs and hit both pools. That night Team IP 380 PLAN SEA cooked us a delicious dinner of roast pork with sauteed apples and onions. 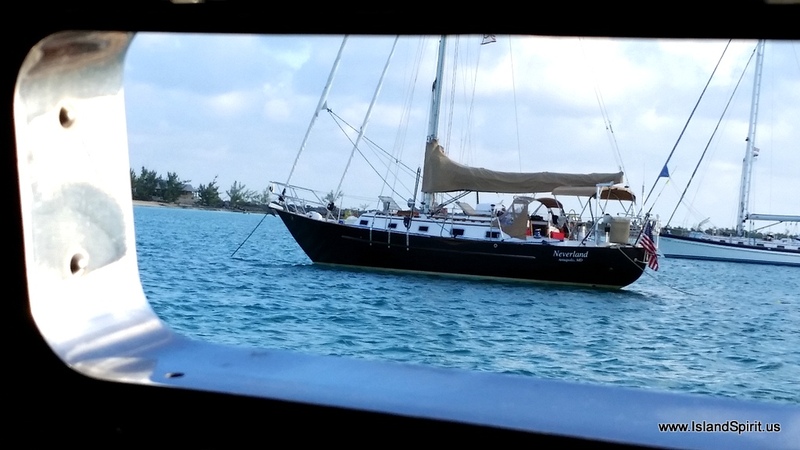 Tuesday, we departed Bimini with a planned passage like Jim and Cynthia of Crealock 34 NEVERLAND did last year, running all night past New Providence to Highbourne Cay, a 28-30 hour run. That sounded great to all of us as we really do not like Nassau and wanted to take this calm weather window East as fast as we could. 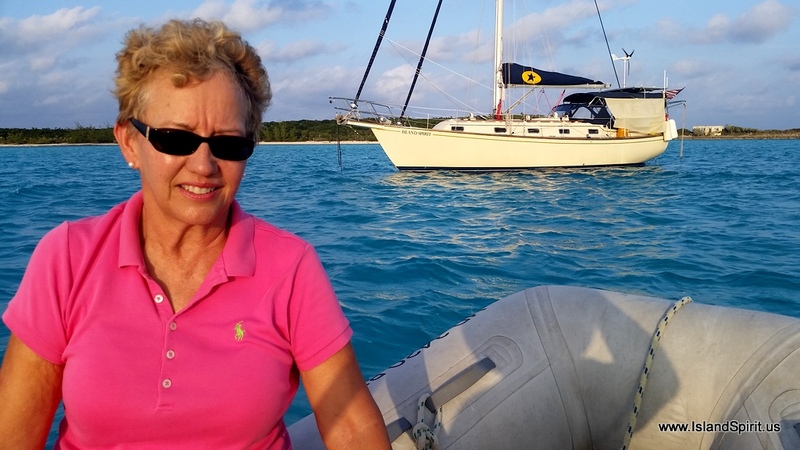 Remember, it is 200+ nautical miles EAST of Miami to reach the Exumas at Highbourne Cay. The trade winds are ALWAYS EAST so it is very difficult to go east. These weather windows only show up every 7-10 days, so many times you are simply waiting back in Miami for the winds to go South or to die down enough to power east. 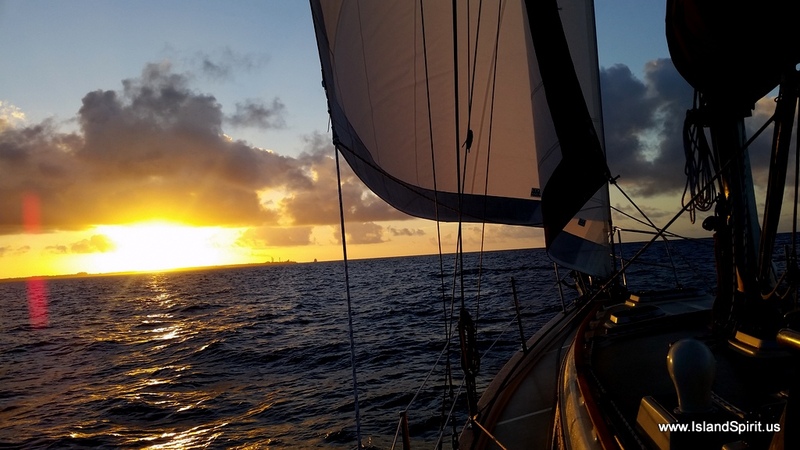 This time, we had 3-4 days of calm before the next front arrives on Thursday night, so we motor sailed the entire 200 nm. 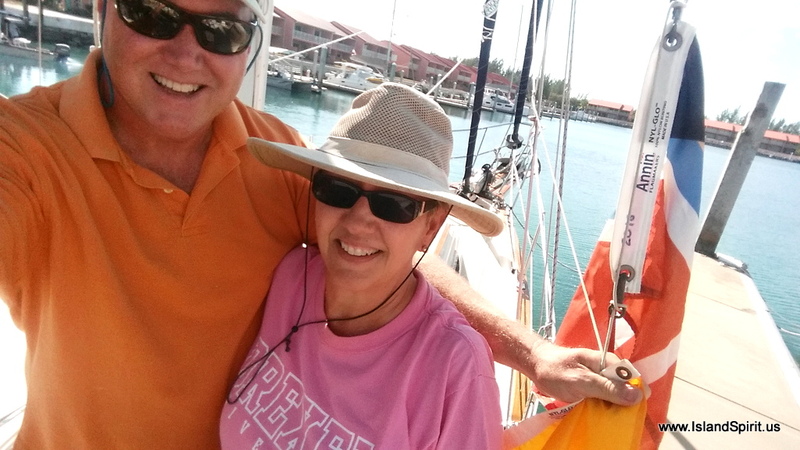 We did have a fantastic sail out of Bimini, sailing south on East winds, to Gun Cay / Cat Cay cut where we turned East and headed out onto the Great Bahama Bank. 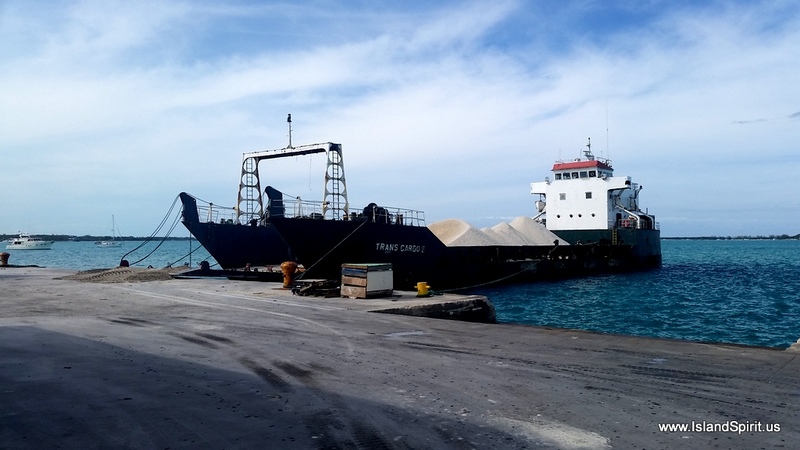 Cuts in the Bahamas are to be respected because the current runs fast between them and the shore is always very hostile, rocky and jagged. 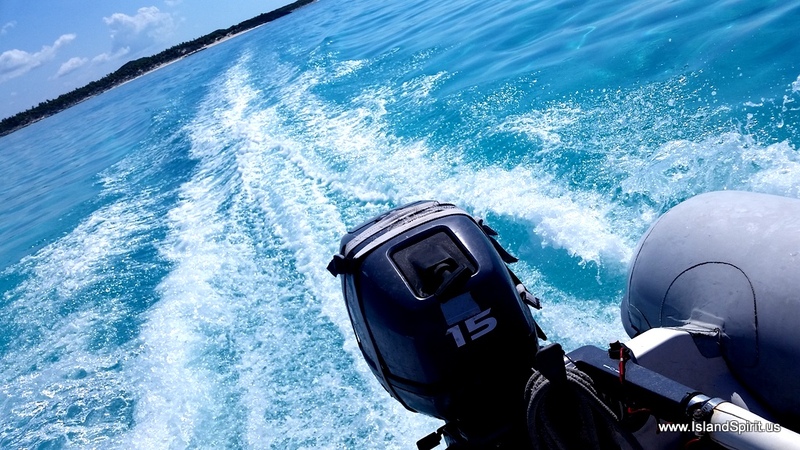 God help you if your engine would ever die when running a Bahamas Cut, if it did, it would be very serious. Because of that, we always keep a sail up when motoring into cuts. 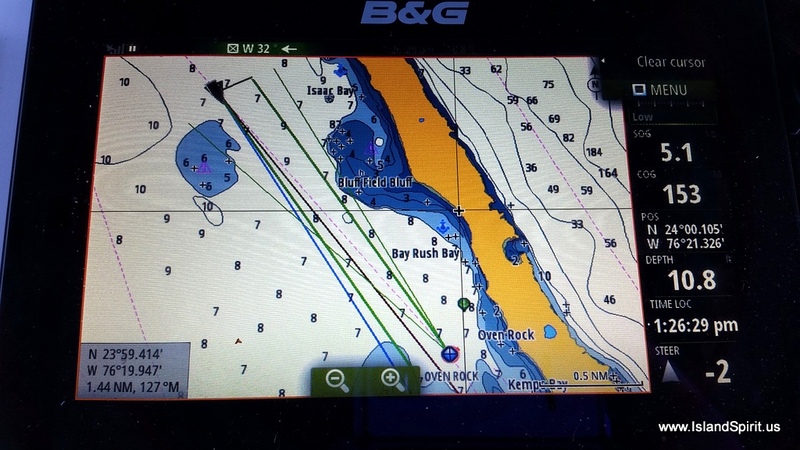 In this photo you can see buddy boat IP380 PLAN SEA powering around the point with his sail up in the rocky cut. Very cool photo. 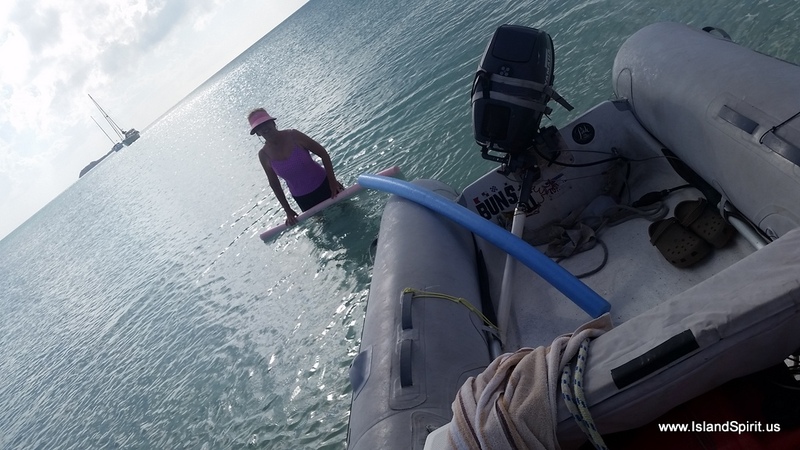 Once up on the Great Bahama Bank, we enjoyed the flat conditions for making lunch and dinner as we motored east til the sun set behind us. 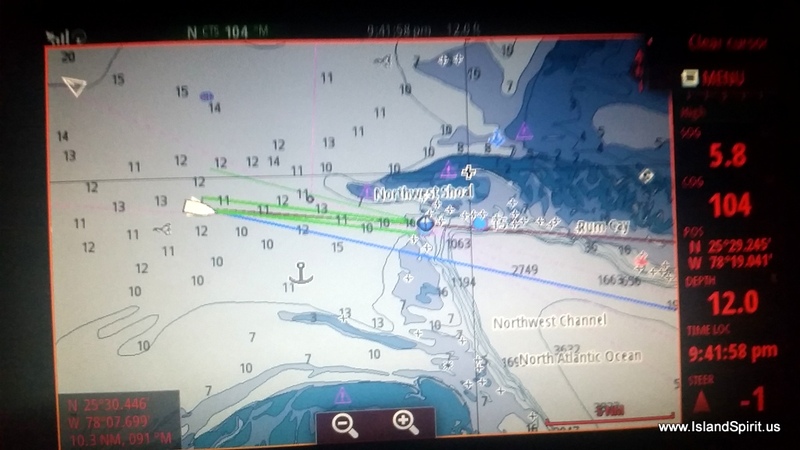 We motored on towards the scary and always challenging Northwest Channel where the the 10 foot waters of the banks flow out into the 5,000 foot depths of the Tongue of the Ocean. This small slot of water framed by rocks and coral reef on each side is the only way through. Due to our speed and the long distance, we always arrive in the dark of night. 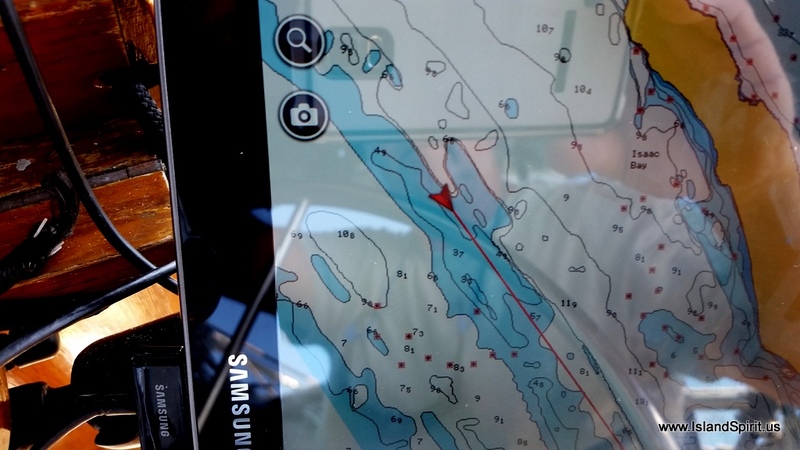 For safety we are running two independent GPS systems on board, one the new B&G Zeus with a rooftop GPS antenna, and one a Samsung Tab2 tablet with builtin GPS and Navionics software. Between these two systems, we feel confident that we know where we are, even though they present the chart data slightly differently. 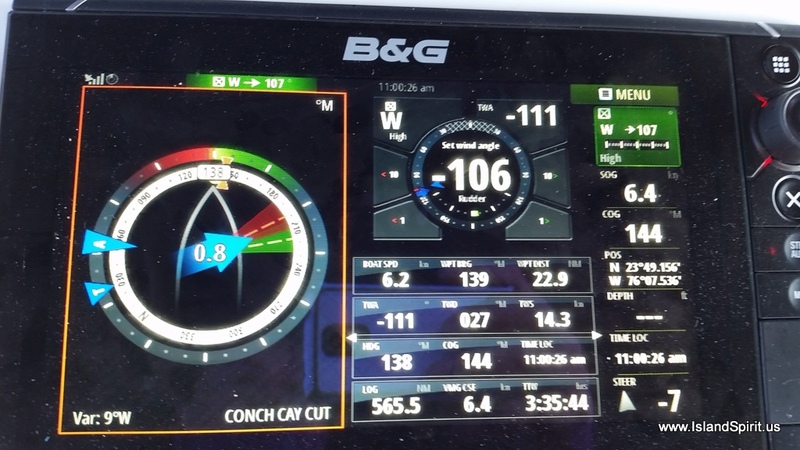 Once through this cut, we bashed our way into big waves as the winds were 10+ knots EAST (all forecasts were for 4-5 knots from t SSE). 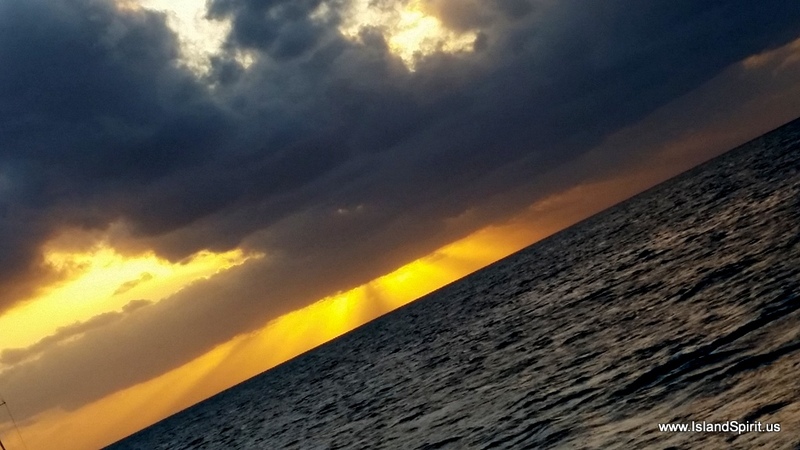 Sunrise peeked through the scattered clouds as we approached the west end of New Providence and we all were happy to be able to see beyond the bow of the boat. Now we could see the salt spray all over the windshields from taking bow waves of salt spray all over the entire deck and canvas. We are so glad we washed the boat yesterday! It is crazy how the wind forecast is rarely right, it may be close, and it may be from the right quadrant but it is not right on. 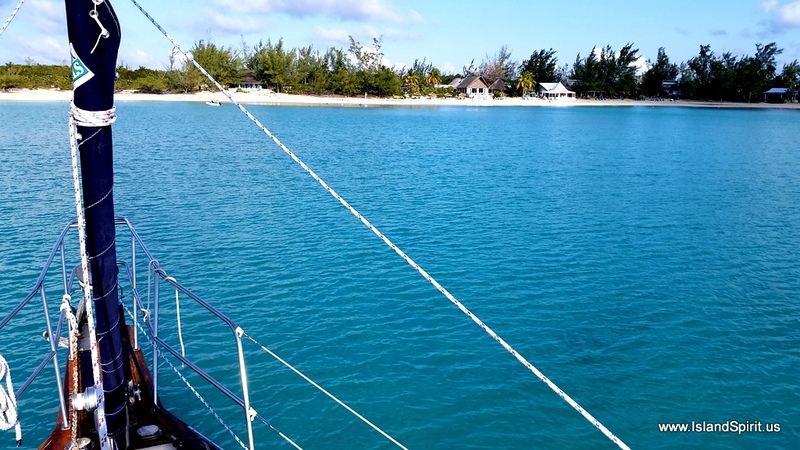 We left the Tongue of the Ocean and crossed up onto the next Bahama Bank and NOW the Exumas were in reach. 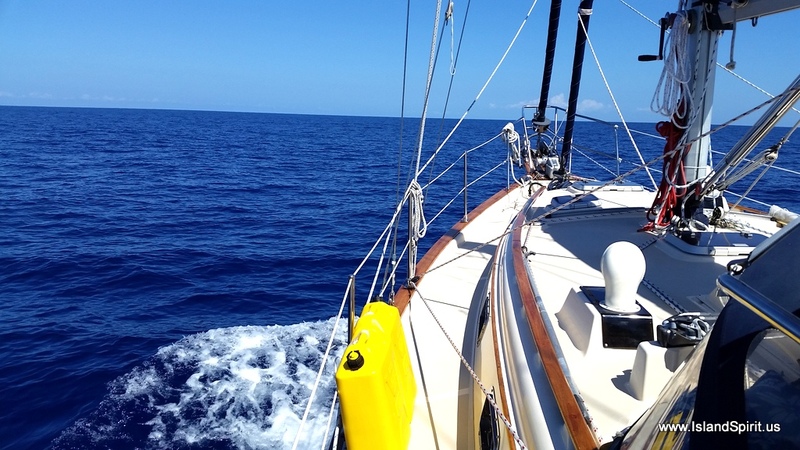 Just another 50 nm (7 hours) and we reached Highbourne Cay where we always re-fuel. We used 32 gallons since Miami….$2.69 a gallon there and $4.41 here. We were grateful to drop and rest after 39 hours of moving. 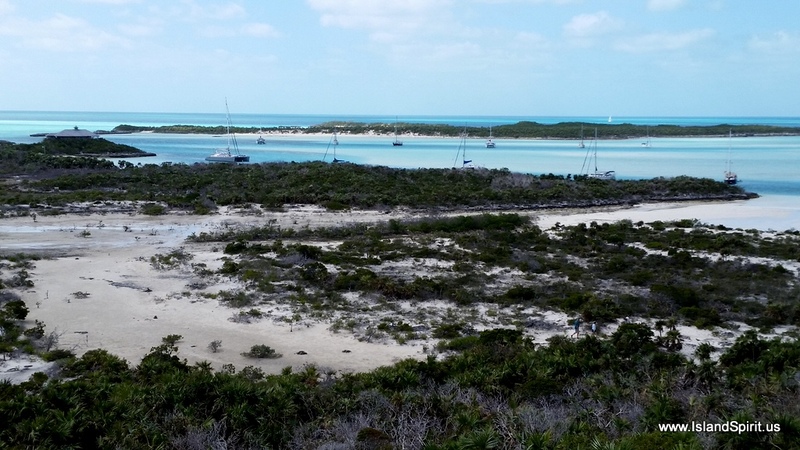 Next stop, Warderick Wells (30 nm south) in the Exuma Land and Sea Park! 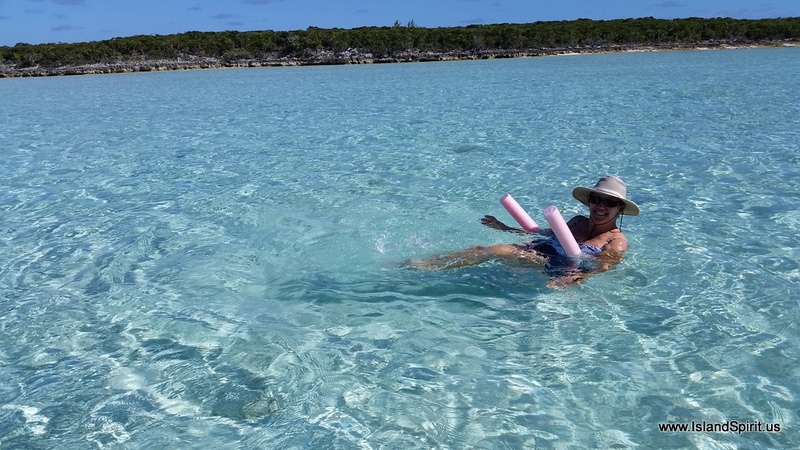 Wait until you see that…..
Look at the water, this is why we sail to the EXUMAS. Here are more photos, Photo Boy loves to take pictures…. We learned how to customize the Zeus2, screen making our own layouts to choose from. Very cool! 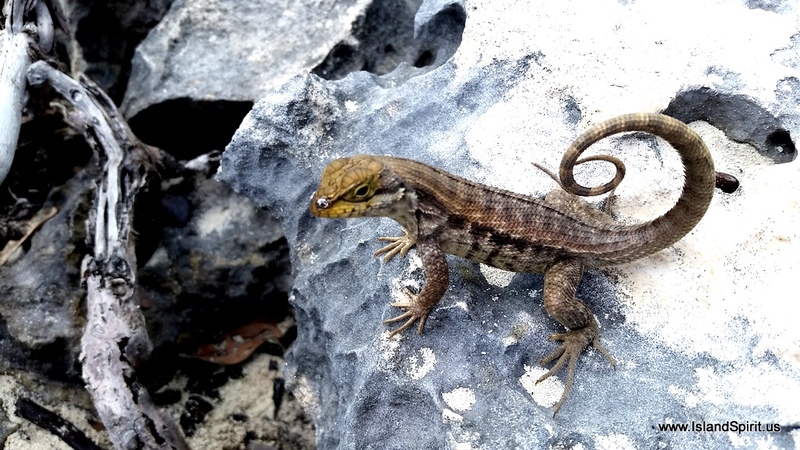 I know this blog post was a little long, but we are so excited to return to the Exumas and I had so many great photos. I shot 375 on two cameras over the past 36 hours. There are so many photo opportunities and I really enjoy the hobby. Thank you for sailing along. Next stop Warderick Wells and the Exuma Land and Sea Park.